本发明是一种组合物，所述组合物包含：a)一种或多种预聚物，所述预聚物具有平均3个以上的脂族异氰酸酯基，并且还含有烷氧基硅烷基；b)一种或多种芳族聚异氰酸酯；c)一种或多种具有至少一个杂环的化合物，所述杂环在暴露于水分时水解以形成至少一个异氰酸酯反应基；d)一种或多种溶剂；和e)一种或多种胺和/或有机金属聚氨基甲酸酯催化剂；其中在所述组合物中，芳族异氰酸酯基与脂族异氰酸酯基的比率为约0.5∶1.0至约1.5∶1.0，优选约0.9∶1.0至约1.5∶1.0，并且异氰酸酯基与可衍生自所述一种或多种具有至少一个可水解杂环的化合物的异氰酸酯反应基的当量比为约0.8∶1.0至约5.3∶1.0，并且最优选约1.5∶1.0至约1.7∶1.0。 The present invention is a composition, said composition comprising: a) one or more prepolymers, the prepolymers having on average three or more aliphatic isocyanate groups and further containing alkoxysilane groups; b) one or more aromatic polyisocyanates; c) one or more compounds having at least one heterocyclic ring, the heterocyclic ring hydrolysis upon exposure to moisture to form at least one isocyanate-reactive group; D), one or more solvents; and e) one or more amines and / or organometallic polyurethane catalysts; wherein in said composition, the ratio of aromatic isocyanate groups to aliphatic isocyanate groups is from about 0.5 to 1.0 to about 1.5:1.0, preferably from about to about 1.5:1.0 0.9:1.0, and isocyanate groups and may be derived from said one or more isocyanate reactive groups having at least one hydrolysable heterocyclic compound equivalent ratio of from about 0.8: 5.3:1.0 to about 1.0, and most preferably from about to about 1.7:1.0 1.5:1.0. 本申请要求在2008年10月29日提交的名称为“含有具有长开放时间的底漆的低能表面粘合体系(Low Energy Surface Bonding System Containing a Primer with LongOpen Time)”的美国临时申请序号61/109，415的优先权，所述美国临时申请的全部内容通过引用结合在此。 US Provisional Application  This application claims the name October 29, 2008 filed "containing low-energy surface adhesive system (Low Energy Surface Bonding System Containing a Primer with LongOpen Time) with a long open time of the primer" as the serial No. 61 / 109,415, the entire contents of the U.S. provisional application is incorporated herein by reference. 本发明涉及一种用于将聚异氰酸酯官能粘合剂连接至基底表面，包括低表面能基底的底漆，所述底漆表现出长开放时间。  The present invention relates to a method for the polyisocyanate functional adhesive connection to the substrate surface, including low surface energy substrates a primer, the primer exhibits a long open time. 在另一个实施方案中，本发明涉及一种含有底漆和异氰酸酯官能粘合剂的粘合体系。 In another embodiment, the present invention relates to an adhesive system containing a primer and an isocyanate functional adhesive. 本发明还涉及用所述底漆涂底漆的制品，并且涉及与本发明的粘合体系粘合的制品。 The present invention also relates to the primer primed article, and the adhesive system of the present invention relates to an adhesive article. 塑料零件在多种制品中正变得更加受到欢迎。  plastic parts become more popular in a variety of products Chiang Kai-shek. 塑料零件提供成本和重量节约并且具有灵活的设计能力。 Plastic parts offers cost and weight savings and flexible design capabilities. 低表面能塑料如聚烯烃由于它们的成本、设计和处理优势而有利于用于许多制品。 Low surface energy plastics such as polyolefins due to their cost, design and process advantages and advantageous for many products. 由于对零件的不同的功能和操作需求，因此许多制品含有由不同材料制造的零件。 Since different functional and operational requirements for the part, many articles containing parts made of different materials. 一些零件优选由低表面能塑料制造，而其它零件则由高表面能塑料、金属、木材和/或玻璃制造。 Preferably some of the parts of a low surface energy plastic and the other part by the high surface energy plastics, metal, wood and / or glass. 利用粘合剂组装制品是有利的，因为粘合剂提供了设计和工艺灵活性。  assembled using an adhesive article is advantageous, since the adhesive provides design and process flexibility. 由于基于聚异氰酸酯的粘合剂很好地粘合多种基底，所以异氰酸酯官能粘合剂体系(通常称为聚氨基甲酸酯粘合剂)是用于粘合各种基底的流行粘合剂体系。 Due to a variety of substrates adhere well polyisocyanate based adhesive, the isocyanate functional adhesive systems (commonly referred to as a polyurethane adhesive) for bonding various substrates are popular adhesive system. 取决于基底和制品的用途，可以将异氰酸酯官能粘合剂体系配制为提供广泛多种性质。 Depending on the use of the substrate and the article, isocyanate functional adhesive systems may be formulated to provide a wide variety of properties. 低能塑料表面典型需要某种表面处理以促进异氰酸酯官能粘合剂体系与这样的表面的粘合。  The low-energy plastic surface typically require some surface treatment to promote adhesion isocyanate functional adhesive systems with such surfaces. 这种处理包括火焰处理、电晕放电处理、表面的化学蚀刻和/或底漆涂敷中的一种或多种。 Such treatments include flame treatment, corona discharge treatment, chemical etching of the surface and / or primer coating of one or more. 典型的底漆体系在下列工艺中使用，在所述工艺中，涂敷底漆，使得溶剂载体挥发掉，然后对基底的表面涂敷粘合剂。 Typical primer system used in the following process, in the process, the primer coating, such that the carrier solvent evaporates, and then the adhesive applied to the surface of the substrate. 用于将低表面能塑料零件粘合在一起或粘合到其它基底的已知体系典型允许相对短的在底漆的涂敷至粘合剂的涂敷之间的开放时间。 Typical known systems for low surface energy plastic parts bonded together or bonded to other substrates in the coating allows for a relatively short time between the primer is applied to the open adhesive. 这些系统的实例在EP 149，856和US专利5，576，558中找到，所述两项专利通过引用结合在此。 Examples of such systems are found in EP 149,856 and US Patent No. 5,576,558, the two patents incorporated by reference herein. 如在此上下文中所使用的开放时间是指其中底漆仍连接至粘合剂体系的在溶剂挥发掉以后的时期。 The open time is used in this context it refers to the period wherein the primer adhesive system still connected after the solvent is volatilized off. 上述的连接是指粘合剂与粘合剂的官能团的化学成键。 Said connecting means a functional group chemically bonded with an adhesive binder. 低表面能塑料零件经常应用于汽车，如内部零件和保险杠面板。  The low surface energy of plastic parts are often used in automobiles, and interior parts such as bumper fascia. 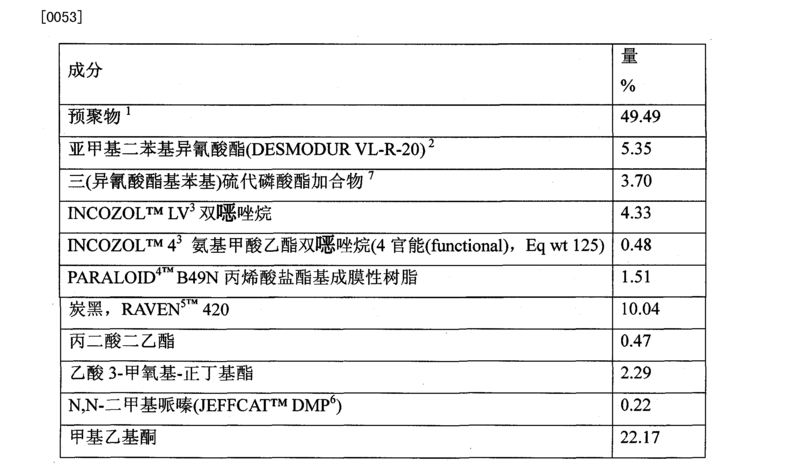 片状模塑料被用于车身零件并且其表面很难粘合。 A sheet molding compound which is used for body parts and hard surface adhesion. 包括汽车制造商在内的许多制造商不希望底漆在组装厂中使用，原因在于使得汽车工人暴露于溶剂蒸气，并且因为环境和安全规程可能要求溶剂去除和通风系统。 Many manufacturers, including automotive manufacturers including undesirable primer used in assembly plants, because the exposure of workers to such cars solvent vapor, and because of environmental and safety regulations may require solvent removal and ventilation systems. 因此，底漆用于组装操作可以使组装厂增加成本并带来健康和安全的担忧。 Therefore, the primer for the assembly plant assembly operations can increase costs and bring health and safety concerns. 理想的是底漆具有长开放时间，从而允许在远离组装操作的时间和场所对基底进行涂敷。 A primer having a desirably long open time to allow the substrate to be coated at a time and place remote from the assembly operations. 在汽车制造的上下文中，这意味着在组件供应商的工厂将组件涂底漆，然后将组件运送到组装汽车的工厂。 In the context of automobile manufacturing, which means that the factory in component suppliers will be primed components, and then shipped the components to automobile assembly plants. 于2008年2月19日提交的共同拥有专利申请US序列号12/03420以及题目为“包含嗯唑烧的单组分玻璃底漆(One Component Glass Primer IncludingOxazoladine) ”的专利合作条约申请PCT/US 08/054公开了一种用于将聚异氰酸酯官能粘合剂连接到玻璃的长开放时间的底漆体系，所述专利通过引用结合在此。 Co-owned US patent application Serial No. 2008, filed February 19 12/03420 and entitled "glass containing single-component primer (One Component Glass Primer IncludingOxazoladine) ah azole burning," the Patent Cooperation Treaty Application PCT / US 08/054 discloses a method for polyisocyanate functional adhesive primer system is connected to the glass ester of a long open time, which is incorporated by reference herein. 在这些申请中没有公开用于将异氰酸酯官能粘合剂体系连接到低能塑料表面的长开放时间的底漆体系。 In these applications do not disclose means for linking the isocyanate functional adhesive systems to the long open time primer system of low-energy plastic surface. 需要一种底漆体系，所述底漆体系能够将异氰酸酯官能粘合剂连接到低表面能基底，其具有长开放时间，高达90天以上。  The need for a primer system, the primer system can be connected to an isocyanate functional adhesive to a low surface energy substrate having a long open time of up to 90 days. 还需要这样的底漆体系，所述底漆体系还可以用于多种其它基底，并且其可以用于将低表面能塑料基底与其它基底如玻璃、金属、涂布金属和具有相对高的表面能的塑料基底粘合。 System is also a need for a primer, the primer system may also be used in a variety of other substrates, and which may be used to low surface energy plastic substrates and other substrates such as glass, metal, coated metal, and has a relatively high surface the plastic substrates can be adhered. 在一个实施方案中，本发明是一种组合物，所述组合物包含:a) —种或多种预聚物，所述预聚物具有平均3个以上的脂族异氰酸酯基，并且还含有烷氧基硅烷基；b) —种或多种芳族聚异氰酸酯；c) 一种或多种具有至少一个杂环的化合物，所述杂环在暴露于水分时水解以形成至少一个异氰酸酯反应基；d) —种或多种溶剂；和e) —种或多种胺和/或有机金属聚氨基甲酸酯催化剂；其中在所述组合物中，芳族异氰酸酯基与脂族异氰酸酯基的比率为约0.5: 1.0至约1.5: 1.0，优选约0.9: 1.0至约1.5: 1.0，并且异氰酸酯基与可衍生自所述一种或多种具有至少一个可水解杂环的化合物的异氰酸酯反应基的当量比为约0.8: 1.0至约5.3: 1.0,并且最优选约1.5: 1.0至约1.7: 1.0。  In one embodiment, the present invention is a composition, said composition comprising: a) - one or more prepolymers, the prepolymers having on average three or more aliphatic isocyanate groups, and further containing alkoxysilane groups; b) - one or more aromatic polyisocyanates; c) at least one or more compounds having a heterocyclic ring, said heterocyclic ring hydrolysis upon exposure to moisture to form at least a isocyanate-reactive group; d) - one or more solvents; and e) - one or more amine and / or organometallic polyurethane catalysts; wherein in the composition, the aromatic isocyanate groups to aliphatic isocyanate ratio group is from about 0.5: 1.0 to about 1.5: 1.0, preferably from about 0.9: 1.0 to about 1.5: 1.0, and an isocyanate group and may be derived from said one or more isocyanate compound having at least one hydrolyzable heterocycle reactive group equivalent ratio is from about 0.8: 1.0 to about 5.3: 1.0, and most preferably about 1.5: 1.0 to about 1.7: 1.0. 在优选的实施方案中，该组合物还包含成膜性树脂。 In a preferred embodiment, the composition further comprises a film-forming resin. 在另一个优选实施方案中，所述一种或多种具有至少一个在暴露于水分时水解的杂环的化合物包含含有一个或多个(one of more)批咯基(azole group)的一种或多种化合物。 In another preferred embodiment, at least one of the one or more compounds hydrolyzes when exposed to moisture comprises one heterocyclic ring having a plurality of containing one or more (one of more) batch pyrrolyl (azole group) of or more compounds. 在另一个实施方案中，本发明是一种用于将两个基底粘合在一起的体系，所述体系包含如上所述的组合物和异氰酸酯官能粘合剂。  In another embodiment, the present invention is a composition and an isocyanate functional adhesive system of two substrates bonded together, as described above for the system comprises. 优选地，该异氰酸酯官能粘合剂为单组分粘合剂体系，并且优选通过暴露于水分而固化。 Preferably, the isocyanate functional adhesive is a one-component adhesive system, and is preferably cured by exposure to moisture. b)将异氰酸酯官能粘合剂涂敷到根据步骤a)对其涂敷所述组合物的两个以上基底的所述表面上；c)将所述两个以上基底在所述粘合剂布置在所述基底之间的情况下接触在一起；和d)允许所述粘合剂固化，从而将所述两个以上基底粘合在一起。 b) applying an isocyanate functional adhesive to step a) the surface of the substrate on which the coating composition of the two or more; c) the two or more substrates disposed on the adhesive in the case of contacting together between the substrate; and d) allowing the adhesive is cured, whereby the two or more substrates together. 在一个优选的实施方案中，所述基底中的至少一个是经表面处理的低表面能塑料。 In a preferred embodiment, the substrate is at least one surface-treated by a low surface energy plastic. 在另一个优选的实施方案中，在远离步骤b)的时间和/或场所进行步骤a)。 In another preferred embodiment, in step a time and / or location remote from the step b)). 在另一个实施方案中，本发明是一种基底，所述基底在所述基底的一个或多个表面上沉积有本发明的组合物。  In another embodiment, the present invention is a substrate, the substrate with the composition of the present invention is deposited on one or more surfaces of said substrate. 在一个优选的实施方案中，该基底是经表面处理的低表面能基底。 In a preferred embodiment, the substrate is surface treated by a low surface energy substrates. 在挥发掉溶剂以后，仅组合物的固体保留表面上，因此减去溶剂的本发明的组合物位于基底的表面上。 After the solvent evaporates, the solid composition only remain on the surface, the composition of the invention minus the solvent located on the surface of the substrate. 在再另一个实施方案中，本发明包括一种组装体，所述组装体包括通过本发明的组合物和异氰酸酯官能粘合剂体系粘合在一起的两个以上的基底。  In yet another embodiment, the present invention includes a body assembly, said assembly comprising a composition and by the isocyanate functional adhesive systems of the present invention bonded together two or more substrates thereof. 典型地，位于一个或多个基底的表面上的组合物不含溶剂。 Typically, in one or more solvent-free composition on the surface of the substrate. 固化粘合剂可以为聚氨基甲酸酯、聚脲或聚氨基甲酸酯-聚脲。 Curable binder may be a polyurethane, polyurea or polyurethane - polyurea. 该基底中的一个或多个可以为低表面能塑料。 One or more of the substrates may be a low surface energy plastic. 在另一个实施方案中，一个基底为低表面能塑料，而另一个基底具有闻表面能。 In another embodiment, a substrate is a low surface energy plastic and the other substrate having a surface energy smell. 本发明的组合物可用于将包括表面低能塑料零件、较高表面能塑料零件、金属零件、玻璃零件、涂布金属零件、复合材料零件和木材零件的多种零件粘合在一起。  The compositions of the invention can be used to comprise a low energy surface plastic parts, bonded together higher surface energy plastic parts, metal parts, glass parts, coated metal parts, composite parts and various parts of the wood part. 当作为底漆体系使用时，本发明的组合物的开放时间可以长达90天，更优选长达9个月，并且最优选长达I年。 When used as a primer system, the open time of the composition of the present invention may be up to 90 days, more preferably up to 9 months, and most preferably up to I years. 优选地，在23°C和50%相对湿度至32°C和80%相对湿度，开放时间介于20秒至90天之间，更优选介于20秒至9个月之间。 Preferably, at 23 ° C and 50% relative humidity to 32 ° C and 80% relative humidity, the open time is between 20 to 90 seconds, 20 seconds and more preferably between 9 months. 本发明的体系可用于将内部装饰粘合到交通工具内部，将塑料零件粘合到玻璃，将饰带粘合到保险杠系统，并且将塑料零件如饰品粘合到基于金属、复合材料或片状模塑料的车身零件。 The system of the present invention may be adhered to the interior trim for a vehicle interior, the glass will be bonded to the plastic parts, bonded to the bumper fascia system, such as jewelry and bonded to the plastic parts based on the metal, or a composite sheet shaped molded plastic body parts. 如本文中使用的开放时间是指从涂敷底漆体系开始的时间，其中所述底漆体系能够连接至异氰酸酯官能粘合剂。  As used herein, open time refers to the time from the beginning of the primer system is applied, wherein the primer system can be connected to an isocyanate functional adhesive. 在一个优选的实施方案中，开放时间在对基底进行涂敷以后、底漆体系的溶剂挥发完毕时开始，并且在基底表面上剩余的组合物部分不再能够连接到粘合剂体系终止。 In a preferred embodiment, the open time after the substrate is coated, the solvent is complete the volatiles began when the primer system, remaining on the substrate surface and the composition is no longer part of the binder system can be connected to the termination. 粘合剂无法与底漆体系连接的证据是在下文所述的性能试验中在经涂底漆的表面上的粘合剂失效。 Evidence adhesive primer system can not connect to an adhesive on the surface is primed failure in the performance test described below. 如本文中使用的连接是指底漆体系与粘合剂体系化学反应形成化学键的能力。 As used herein, connector refers to the ability of a chemical bond with the primer system to form a chemical binder system. 连接的证据是在如下文所述的性能试验中的内聚破坏展示出来。 The evidence linking is cohesive failure in the performance test described below in the displayed. 关于低表面能塑料采用的表面处理是指用于将表面氧化以在塑料的表面上产生另外的极性基团的表面处理。 On low surface energy plastic surface treatment means used for the surface treatment to the surface oxidation of the additional polar group on the surface of the plastic. 这可以通过对表面进行化学蚀刻、火焰处理、电晕放电等处理而达到。 This process may be chemical etching, flame treatment, corona discharge is achieved by the surface. 高的或较高的表面能意味着表面具有相当大量的极性基团在表面上，以允许粘合剂体系粘合到该表面(连接于该表面)。  High surface energy or higher means that the surface has a relatively large amount of polar groups on the surface to allow the adhesive to the surface of the adhesive systems (attached to the surface). 通常，粘合剂体系，例如异氰酸酯官能粘合剂体系，能够在不需要底漆体系或表面处理的情况下粘合到高表面能基底。 Typically, the binder system, such as an isocyanate functional adhesive system, the adhesive can be in the system without the need for primer or surface treatment to high surface energy substrates. 本发明的组合物的一个组分是一种或多种预聚物，所述预聚物具有平均3个以上的脂族异氰酸酯基，并且还含有烷氧基硅烷基。  A component of the composition of the present invention is one or more prepolymers, the prepolymers having on average three or more aliphatic isocyanate groups and further containing alkoxysilane groups. 脂族异氰酸酯基是连接到非芳族碳原子的异氰酸酯基。 Aliphatic isocyanate groups is connected to a non-aromatic carbon atom of the isocyanate group. 如本文中所使用的预聚物是指，在使得预聚物具有平均3个以上的异氰酸酯反应基的情况下，一种或多种脂族聚异氰酸酯与一种或多种具有3个以上的反应性氢原子的化合物的反应产物。 The prepolymer as used herein refers to, in the case of such prepolymer having an average of 3 or more isocyanate reactive groups, one or more aliphatic polyisocyanates with one or more compounds having three or more the reaction product of the compound reactive hydrogen atoms. 含有脂族异氰酸酯的预聚物的还包含烷氧基硅烷基。 Containing prepolymer aliphatic isocyanate further comprises an alkoxysilane group. 烷氧基硅烷基包含具有与硅原子结合的一个或多个烷氧基的硅原子。 Alkoxysilane group comprising a silicon atom bonded to a silicon atom having one or more alkoxy groups. 优选地，硅原子具有两个或三个与其连接的烷氧基。 Preferably, the silicon atom having two or three alkoxy groups attached thereto. 硅原子还可以连接到碳、硅或杂原子如氧、氮或硫。 It may also be connected to a silicon atom carbon, silicon or heteroatoms such as oxygen, nitrogen or sulfur. 通过下列方法将烷氧基硅烷结合到含脂族异氰酸酯的预聚物中:将具有一个或多个烷氧基硅烷和一个或多个异氰酸酯反应基或异氰酸酯基的化合物与脂族异氰酸酯和异氰酸酯反应性化合物反应。 By the following method alkoxysilane incorporated into the prepolymer containing aliphatic isocyanates of: having one or more alkoxy silanes and one or more isocyanate reactive groups or isocyanate group-containing compound with an aliphatic isocyanate and isocyanate-reactive The reaction of the compound. 优选地，含脂族异氰酸酯的预聚物具有4个以上的脂族异氰酸酯基。 Preferably, the prepolymer is an aliphatic isocyanate having 4 or more aliphatic isocyanate groups. 优选地，含脂族异氰酸酯的预聚物具有6个以下的脂族异氰酸酯基，并且更优选5个以下的脂族异氰酸酯基。 Preferably, the prepolymer is an aliphatic isocyanate having 6 or less aliphatic isocyanate groups, and more preferably 5 or less aliphatic isocyanate groups. 如本文中使用的术语“异氰酸酯反应性化合物”包括具有至少两个异氰酸酯反应性部分的任何有机化合物，如含有活性氢部分的化合物，或亚氨基官能化合物。  As used herein, the term "isocyanate-reactive compounds" includes any organic compound having at least two isocyanate-reactive moieties, such as a compound containing an active hydrogen moiety, or an imino-functional compound. 就本发明而言，含活性氢的部分是指含有氢原子的部分，所述氢原子由于其在分子中的位置而显示出根据Wohler 在美国化学会志(Journal of the American Chemical Society),第49 卷，第3181页(1927)中描述的Zerewitnoff实验的显著活性。 For the present invention, an active hydrogen containing moiety refers to a moiety containing a hydrogen atom, a hydrogen atom because of its position in the molecule exhibit The Wohler in the American Chemical Society (Journal of the American Chemical Society), the first 49, pages 3181 Zerewitnoff significant activity experiment (1927) described. 这样的活性氢部分示意性实例为-C00H，-OH, -NH2, -NH-, -CONH2, -SH和-C0NH-。 Such active hydrogen moiety illustrative examples are -C00H, -OH, -NH2, -NH-, -CONH2, -SH and -C0NH-. 优选的含活性氢的化合物包括多元醇、多胺、聚硫醇和多酸。 Preferred active hydrogen containing compounds include polyols, polyamines, polymercaptans and polyacids. 适宜的亚氨基官能化合物是每分子具有至少一个末端亚氨基的那些，如在例如美国专利4，910，279中所描述的，所述美国专利通过引用整个结合在此。 Suitable imino-functional compound having per molecule at least one end of those, for example, as described in 4,910,279 in U.S. Patent No. imino group, and the U.S. Patent are incorporated herein by reference in whole. 优选地，异氰酸酯反应性化合物为多元醇，并且更优选聚醚型多元醇。 Preferably, the isocyanate-reactive compound is a polyol, and more preferably a polyether polyol. 优选地，用于制备预聚物的多元醇包括Wu在美国专利6，512，033第4栏第10行至第64行中公开的那些多元醇，所述美国专利通过引用结合在此，并且包括如聚醚型多元醇、聚酯型多元醇、聚(碳酸亚烃酯)多元醇、含羟基的聚硫醚、聚合物多元醇(乙烯基聚合物在这样的多元醇中的分散体，通常称为共聚物多元醇)和它们的混合物。 Preferably, the polyol used in preparing the prepolymer include those disclosed in Wu polyols U.S. Patent 6,512,033 at column 4, line 10 to line 64, the U.S. Patent incorporated by reference herein, and the polyether polyols include polyester polyols, poly (alkylene carbonate) polyols, hydroxyl containing polythioethers, polymer polyols (dispersions of vinyl polymers in such polyols, commonly referred to as copolymer polyols) and mixtures thereof. 优选的多元醇为在多元醇的主链中含有一个或多个烯化氧单元的聚醚型多元醇。 Preferred polyols containing one or more alkylene oxide units in the polyether polyol in the backbone polyol. 优选的烯化氧单元为环氧乙烷、环氧丙烷、环氧丁烷和它们的组合。 Preferred alkylene oxide units are ethylene oxide, propylene oxide, butylene oxide, and combinations thereof. 烯化氧可以含有直链或支链的亚烷基单元。 Alkylene unit of the alkylene oxide may be a straight-chain or branched. 优选地，多元醇含有环氧丙烷单元，环氧乙烯单元或它们的混合物。 Preferably, the polyol contains propylene oxide units, ethylene oxide units, or mixtures thereof. 在多元醇中含有烯化氧单元的混合物的实施方案中，烯化氧单元的组合包含在多羟基化合物中，不同单元可以无规安排或可以以每一种烯化氧的嵌段的形式排列。 The mixture of Embodiment alkylene oxide units contained in the polyol, the composition of the alkylene oxide units contained in the polyhydroxy compounds, the different units may be randomly arranged or may be arranged in the form of blocks each of alkylene oxide . 在一个优选的实施方案中，多元醇包含具有将所述多元醇封端的环氧乙烷链的环氧丙烷链。 In a preferred embodiment, the polyol comprises propylene oxide chain of the polyol having an ethylene oxide-terminated chains. 异氰酸酯反应性化合物具有优选至少约3.0并且最优选至少约4.0的官能度；和优选不大于约6.0并且最优选不大于约5.0的官能度。 Isocyanate-reactive compound having preferably at least about 3.0, and most preferably a functionality of at least about 4.0; and preferably no greater than about 6.0, and most preferably no greater than about 5.0 functionality. 异氰酸酯反应性化合物的当量优选约为至少约50，更优选至少约100，并且最优选至少约300 ;和优选为不大于约1500并且最优选不大于约1000。 Equivalent of isocyanate-reactive compound is preferably from about at least about 50, more preferably at least about 100, and most preferably at least about 300; and preferably not greater than about 1500, and most preferably no greater than about 1000. 本发明中使用的预聚物可以由任何适当的方法制备，如本体聚合和溶液聚合。  The prepolymer used in the invention may be made by any suitable method, such as bulk polymerization and solution polymerization. 用于制备预聚物的反应在无水条件下进行，优选在惰性气氛如氮气层下进行以防止异氰酸酯基由于大气水分所致而交联。 The reaction for preparing the prepolymer is carried out under anhydrous conditions, preferably in order to prevent the isocyanate groups by atmospheric moisture-induced crosslinking under an inert atmosphere such as a nitrogen blanket. 该反应在优选约0°C至约150°C之间，更优选在约25°C至约90°C之间的温度进行，直至由样品滴定确定的剩余异氰酸酯含量与期望的理论值非常接近为止。 The reaction is preferably from about 0 ° C to about 150 ° C, more preferably to a temperature between about 90 ° C at about 25 ° C, until the theoretical value of the remaining isocyanate content desired as determined by titration of a sample is very close to until. 预聚物中的异氰酸酯含量优选为约0.1重量％以上，更优选为约1.5重量％以上，并且最优选为约1.8重量％以上。 The prepolymer isocyanate content is preferably from about 0.1 wt%, more preferably less than about 1.5% by weight, and most preferably about 1.8% by weight. 预聚物中的异氰酸酯含量优选为约10重量％以下，更优选为约5重量％以下，再更优选为4.5重量％以下，并且最优选为3重量％以下。 The prepolymer isocyanate content is preferably from about 10 wt%, more preferably from about 5 wt% or less, still more preferably 4.5 wt% or less, and most preferably 3 wt% or less. “异氰酸酯含量”是指异氰酸酯部分相对于预聚物的总重量的重量百分数。 "Isocyanate content" refers to the isocyanate moieties with respect to the total weight percent of the prepolymer. 用于制备预聚物的反应可以在氨基甲酸乙酯催化剂的存在下进行。 The reaction for preparing the prepolymer may be conducted in the presence of urethane catalysts. 这样的实例包括羧酸的锡盐，如辛酸锡，油酸锡，乙酸锡，和月桂酸锡。 Examples of such include tin salts of carboxylic acids, such as tin octylate, tin oleate, tin acetate, tin laurate. 而且，二羧酸二烷基锡例如二月桂酸二丁基锡和二乙酸二丁基锡盐在本领域中已知作为氨基甲酸乙酯催化剂，同样的是叔胺和硫醇锡。 Also, dialkyltin dicarboxylic acids such as dibutyl tin dilaurate and dibutyl tin diacetate salts known in the art as urethane catalysts, tertiary amines, and the same is tin mercaptides. 优选地，通过辛酸锡催化用于制备预聚物的反应。 Preferably, the stannous octoate catalyst used in the reaction to prepare the prepolymer. 取决于异氰酸酯的属性，使用的催化剂的量通常介于被催化的混合物的约0.005至约5重量份之间。 Between the properties depending on the isocyanate, the amount of catalyst used is generally a catalytic mixture is between about 0.005 to about 5 parts by weight. 含脂族异氰酸酯的预聚物以充分量存在于本发明的组合物中，使得本发明的组合物能够与异氰酸酯官能预聚物连接。  The prepolymer is an aliphatic isocyanate in a sufficient amount present in the composition according to the present invention, such compositions of the invention can be connected to the prepolymer isocyanate functionality. 基于本发明的组合物的重量，含脂族异氰酸酯的预聚物以优选约40重量份以上，更优选约45重量份以上并且最优选约50重量份以上的量存在。 Based on the weight of the composition of the present invention, about 45 parts by weight of the prepolymer of aliphatic isocyanates containing at least about 40 parts by weight preferably, and more preferably an amount of about 50 parts by weight or more and most preferably is present. 基于本发明的组合物的重量，含脂族异氰酸酯的预聚物以优选约90重量份以下，更优选约80重量份以下并且最优选约60重量份以下的量存在。 Based on the weight of the composition of the present invention, the aliphatic prepolymers containing isocyanate is preferably about 90 parts by weight or less, more preferably about 80 parts by weight or less and most preferably about 60 parts by weight or less is present. 用于制备含脂族异氰酸酯的官能预聚物的聚异氰酸酯包括含有与非芳族碳原子连接的平均2个以上的异氰酸酯基的任何异氰酸酯。 The polyisocyanate functional  for the preparation of aliphatic isocyanate-containing prepolymer include any isocyanate containing on average two or more isocyanate groups linked to a non-aromatic carbon atoms. 在用于本发明的优选脂族聚异氰酸酯中，包括乙二醇二异氰酸酯(ethylene diisocyanate)、异佛尔酮二异氰酸酯、双-(4_异氰酸酯环己基)甲烧(bis (4-1socyanate cyclohexyl) methane)、三甲基1,6-己二异氰酸酯、1，4-四亚甲基二异氰酸酯、1，6-己二异氰酸酯、1，12-十二烷二异氰酸酯、环丁烷-1，3-二异氰酸酯、环丁烷-1，3-和1，4_ 二异氰酸酯，和这些异构体的混合物；1_异氰酸酯基(isocyanato) 3, 3, 5_三甲基5_异氰酸酯基甲基环己烧和异佛尔酮二异氰酸酯。 In a preferred aliphatic used in the present invention are polyisocyanates including ethylene diisocyanate (ethylene diisocyanate), isophorone diisocyanate, bis - (4_ isocyanate cyclohexyl) methyl burning (bis (4-1socyanate cyclohexyl) methane), trimethyl hexamethylene diisocyanate, 1,4-tetramethylene diisocyanate, hexamethylene diisocyanate, 1,12-dodecane diisocyanate, cyclobutane-1,3 - diisocyanate, cyclobutane-1,3-diisocyanate and 1,4_, and mixtures of these isomers; 1_ isocyanate group (isocyanato) 3, 3, 5_ 5_-trimethyl-methylcyclohexyl isocyanate group hexyl burning and isophorone diisocyanate. 更优选的脂族聚异氰酸酯包括1，6_己二异氰酸酯和异佛尔酮二异氰酸酯。 More preferred aliphatic polyisocyanates include 1,6_ hexamethylene diisocyanate and isophorone diisocyanate. 用于制备含脂族异氰酸酯的预聚物的烷氧基硅烷包括具有一个或多个异氰酸酯反应基或异氰ί酸酷基的任何烧氧基娃烧。 Alkoxysilane prepolymers  for the preparation of an aliphatic isocyanates include those having one or more isocyanate reactive group or isobutyl group baby burn any ί acid cyanomethyl group cool burning. 优选地，烧氧基娃烧相对于每个娃烧具有平均2至3个烷氧基。 Preferably, the group baby burn burn burn with respect to each baby has an average of 2 to 3 alkoxy groups. 优选的异氰酸酯反应基为具有活性氢原子的基团。 Preferred isocyanate-reactive group is a group having an active hydrogen atom. 使用的更优选的的异氰酸酯反应基包括羟基、羧酸、巯基和氨基。 More preferably the isocyanate-reactive groups used comprise hydroxyl, carboxylic acid, mercapto and amino. 用于本发明的更优选的烷氧基硅烷包括1-巯基丙基三甲氧基硅烷和双(三甲氧基-甲硅烷基丙基)胺。 More preferred alkoxysilanes used in the present invention include 1-mercapto-propyl-trimethoxysilane, and bis (trimethoxy - silyl propyl) amine. 含脂族异氰酸酯的预聚物优选含有约3.0重量％以上的烧氧基娃烧基，并且更优选含有约8.0重量％以上的烧氧基娃烧基。 Containing prepolymer aliphatic isocyanate preferably comprises from about 3.0 wt% or more burn baby burn-yl group, and more preferably contains from about 8.0 wt% or more burn baby burn-yl group. 含脂族异氰酸酯的预聚物优选含有约30重量％以下的烷氧基硅烷基，并且更优选含有约25重量％以下的烷氧基硅烷基。 Containing prepolymer aliphatic isocyanate preferably comprises from about 30% by weight of an alkoxysilane group, and more preferably from about 25 wt% or less alkoxysilane group. 含脂族异氰酸酯的预聚物优选含有约2.5重量％以上的异氰酸酯基，并且更优选含有约3.5重量％以上的异氰酸酯基。 Containing prepolymer aliphatic isocyanate preferably comprises from about 2.5 wt% or more isocyanate groups, and more preferably at least about 3.5% by weight of isocyanate groups. 含脂族异氰酸酯的预聚物优选含有约6.0重量％以下的异氰酸酯基，并且更优选含有约5.0重量％以下的异氰酸酯基。 Containing prepolymer aliphatic isocyanate preferably comprises from about 6.0% by weight of isocyanate groups, and more preferably from about 5.0% by weight of isocyanate groups. 具有至少3个以上的脂族异氰酸酯基的预聚物具有用于作为底漆组合物的足够的数均分子量。 Prepolymer having at least three aliphatic isocyanate groups having a sufficient number average molecular weight as a primer composition. 优选地，数均分子量(Mn)为约500道尔顿以上，并且更优选为1，000道尔顿以上。 Preferably, the number-average molecular weight (Mn) of greater than about 500 daltons, and more preferably less than 1,000 daltons. 优选地，数均分子量(Mn)约为6，000道尔顿以下，并且更优选为5，000道尔顿以下。 Preferably, the number-average molecular weight (Mn) of about 6,000 daltons or less, and more preferably 5,000 daltons or less. 本发明的组合物还包含一种或多种芳族聚异氰酸酯。 The composition  The present invention further comprises one or more aromatic polyisocyanates. 芳族聚异氰酸酯是具有平均约多于I个、优选多于约2个连接到芳族碳原子的异氰酸酯基的化合物。 Aromatic polyisocyanates having an average of more than about I, about two isocyanate compound is linked to an aromatic group of carbon atoms preferably more than. 芳族异氰酸酯为与芳族碳原子连接的异氰酸酯。 Aromatic isocyanates and isocyanate connection aromatic carbon atoms. 可以在本发明中使用具有平均多于I个，优选多于2个芳族异氰酸酯基的任何化合物、低聚物或预聚物。 I may be used having an average of more than one in the present invention, preferably more than any of the compounds, oligomers or prepolymers two aromatic isocyanate groups. 所述一种或多种芳族聚异氰酸酯优选包含聚异氰酸酯，聚合的聚异氰酸酯(polymeric polyisocyanates),或聚异氰酸酯与具有一个或多个的异氰酸酯反应基的化合物的加合物中的一种或多种。 The one or more aromatic polyisocyanates preferably comprise polyisocyanates, polymeric polyisocyanates (polymeric polyisocyanates), or polyisocyanates having an adduct compound of isocyanate-reactive groups of one or more of one or more species. 再更优选地，所述一种或多种芳族聚异氰酸酯包含:i) 一种或多种聚异氰酸酯或聚合的聚异氰酸酯，和ii)聚异氰酸酯与还含有烷氧基硅烷基的具有一个或多个异氰酸酯反应基的化合物的一种或多种加合物。 Even more preferably, the one or more aromatic polyisocyanates comprises: i) one or more polyisocyanates or polymeric polyisocyanates and ii) a polyisocyanate and further containing alkoxysilane groups having one or one or more of the plurality of isocyanate adduct of isocyanate-reactive groups of the compound. 再更优选地，聚异氰酸酯与具有一个或多个异氰酸酯反应基的化合物的一种或多种加合物包含含磷聚异氰酸酯和含有与异氰酸酯基反应的两个以上的氨基的氨烷基硅烷的反应产物。 Even more preferably, a polyisocyanate with a compound having one or more isocyanate reactive groups of one or more adducts containing aminoalkyl silane phosphorus-containing polyisocyanate and two or more amino groups reacting with the isocyanate groups of reaction product. 在芳族聚异氰酸酯是聚异氰酸酯与具有一个或多个异氰酸酯反应基的一种或多种化合物的加合物的实施方案中，含有异氰酸酯反应基的化合物可以是如之前所述的任何的这样的化合物，其中具有一个或多个异氰酸酯反应基的化合物具有600以上、优选800以上，并且更优选1，000以上的数均分子量。 Aromatic polyisocyanates are polyisocyanates embodiments ester adduct having one or more compounds of one or more isocyanate reactive groups, compounds of the isocyanate-reactive group which can be as described before any such compounds, compounds wherein one or more isocyanate reactive groups having having 600 or more, preferably 800 or more, and more preferably the number average molecular weight of 1,000 or more. 具有两个以上的异氰酸酯反应基的化合物优选表现出6，000以下、优选5，000以下并且更优选4，500以下的平均分子量。 A compound having two or more isocyanate reactive groups exhibits preferably 6,000 or less, preferably 5,000 or less, and more preferably an average molecular weight of 4,500 or less. 在一个优选的实施方案中，加合物包含下列各项的加合物:芳族聚异氰酸酯，含有两个以上的异氰酸酯反应化合物(compounds)的化合物,和具有一个或多个烧氧基娃烧基和一个或多个异氰酸酯反应基的一种或多种化合物。 In a preferred embodiment, the adduct comprises the adduct of the following: an aromatic polyisocyanate, a compound containing two or more isocyanate reactive compounds (Compounds), and having one or more group burn baby burn a base and one or more isocyanate reactive groups or more compounds. 在这里使用的所述具有一个或多个烷氧基硅烷基和一个或多个异氰酸酯反应基的一种或多种化合物是用于含有3个以上的脂族异氰酸酯基的预聚物的之前所述的那些。 The used herein having one or more alkoxy silane groups and one or more of an isocyanate reactive groups or more compounds previously used for the prepolymer containing three or more aliphatic isocyanate groups those mentioned. 在优选的芳族聚异氰酸酯中，包括甲基二苯基二异氰酸酯、甲苯二异氰酸酯、苯二异氰酸酯、2，4'_和2，6_甲苯二异氰酸酯和这些异构体的混合物，亚萘基-1，5-二异氰酸酯、三苯基甲烷-4，4'，4”_三异氰酸酯和它们的聚合物衍生物和三(异氰酸酯基苯基)硫代磷酸酯。更优选的聚异氰酸酯包含甲基二苯基二异氰酸酯及其聚合物衍生物和三(异氰酸酯基苯基)硫代磷酸酯。在一个优选的实施方案中，芳族聚异氰酸酯是一种或多种芳族聚异氰酸酯和/或其聚合物衍生物和一种或多种含磷酸酯的芳族聚异氰酸酯的混合物。该芳族聚异氰酸酯以足够的量存在，以促进基底粘合和与开环的杂环化合物反应。优选地，该芳族聚异氰酸酯以约4重量％以上并且最优选7重量％以上的量存在。优选地，该芳族聚异氰酸酯以约30重量％以下、更优选约25重量％以下、更优选约25重 In preferred aromatic polyisocyanate, including a mixture of methylene diphenyl diisocyanate, toluene diisocyanate, xylylene diisocyanate, 2,4'_ and 2,6_ toluene diisocyanate, and of these isomers, naphthylene 1,5-diisocyanate, triphenylmethane-4,4 ', 4 "triisocyanate _ and polymer derivatives thereof and tris (isocyanate phenyl) thiophosphate. more preferred a polyisocyanate comprising diphenyl diisocyanate and polymeric derivatives and tris (isocyanate phenyl) thiophosphate. in a preferred embodiment the aromatic polyisocyanate is one or more aromatic polyisocyanates and / or its derivatives and polymer mixtures of one or more aromatic polyisocyanates containing phosphate. the aromatic polyisocyanate is present in an amount sufficient to promote adhesion to substrates, and a heterocyclic compound with a ring-opening reaction. preferably the aromatic polyisocyanates to above about 4 wt% and most preferably 7 wt% or more is present. preferably, the aromatic polyisocyanate to about 30 wt%, more preferably from about 25 wt%, more preferably from about 25 weight ％以下、再更优选约22重量％以下并且最优选约18重量％以下的量存在。在芳族聚异氰酸酯包含一种或多种芳族异氰酸酯和/或其聚合物衍生物和一种或多种含磷酸酯的芳族聚异氰酸酯的实施方案中，芳族聚异氰酸酯和/或其聚合物衍生物的量为约I重量％以上并且最优选约3重量％以上，并且含磷酸酯的芳族聚异氰酸酯的量为约I重量％以上并且更优选约4重量％以上。在这样的实施方案中，芳族聚异氰酸酯和/或其聚合物衍生物的量为约20重量％以下、更优选约15重量％以下并且最优选11重量％以下，并且含磷酸酯的芳族聚异氰酸酯的量为约10重量％以下并且更优选约7重量％以下。在一个优选的实施方案中，芳族聚异氰酸酯的数均分子量为约200以上并且更优选约300以上。在一个优选的实施方案中，芳族聚异氰酸酯的数均分子量为约800以下并且更优选约500以 % Or less, even more preferably about 22% by weight or less and most preferably about 18 wt% or less is present in the aromatic polyisocyanate comprises one or more aromatic isocyanates and / or a derivative thereof and one or more polymers embodiments species aromatic polyisocyanates containing phosphate, the / amount of the aromatic polyisocyanate and a polymer or a derivative thereof is from about I wt% or more and most preferably about 3% by weight or more, and the aryl group-containing phosphate the amount of the polyisocyanate is from about I wt% or more, and more preferably from about 4 wt% or more. in such an embodiment, / amount of the aromatic polyisocyanate and or polymer derivative is from about 20 wt%, more preferably from about 15 wt% or less and most preferably 11 wt% or less, and the amount of the aromatic polyisocyanate containing phosphate ester is about 10 wt% or less, and more preferably from about 7% by weight. in a preferred embodiment, the aromatic polyisocyanates a number average molecular weight of about 200 or more, and more preferably about 300 or more. in a preferred embodiment, the number of aromatic polyisocyanates average molecular weight of about 800 or less, and more preferably from about 500 to 下。在一个优选的实施方案中，该芳族聚异氰酸酯显示出约0.9至约5.5重量％的异氰酸酯含量。 Below. In a preferred embodiment, the aromatic polyisocyanates exhibit an isocyanate content of 5.5 weight from about to about 0.9% by weight. 本发明的组合物包含一种或多种具有至少一个杂环的化合物，所述杂环在暴露于水分时水解以形成至少一个异氰酸酯反应基。  The compositions of the present invention comprises one or more compounds having at least one heterocyclic ring, the heterocyclic ring to form a hydrolysis when exposed to moisture at least one isocyanate-reactive group. 优选地，该环含有一个或多个氮和/或氧原子并且在水解时形成羟基和或氨基。 Preferably, the ring contains one or more nitrogen and / or oxygen atom and a hydroxyl group or an amino group and is formed upon hydrolysis. 最优选地，该杂环同时含有至少一个氧和至少一个氮原子。 Most preferably, the heterocyclic ring containing at least one oxygen and at the same time at least one nitrogen atom. 优选地，在水解时形成至少一个羟基和至少一个氨基。 Preferably, at least one amino group and at least one hydroxyl group upon hydrolysis. 优选地，该杂环为5或6元的，并且优选5元环。 Preferably, the heterocyclic ring is a 5 or 6-membered, and preferably 5-membered ring. 优选地，该杂环为吡咯环。 Preferably, the heterocyclic ring is a pyrrole ring. 在一个优选的实施方案中，所述一种或多种具有至少一个在暴露于水分时水解的杂环的化合物包含含有一个或多个赚唑烷基、异嗯唑烧基、囉唑烧酮(oxazolidinone)基或囉唑烧二酮基的一种或多种化合物。 In a preferred embodiment, the one or more compounds having at least one hydrolyzed when exposed to moisture comprises one or more heterocyclic make oxazolidinyl, isobutyl group containing ah yl burn, burn La yl ketone (oxazolidinone) groups, or one or more compounds oxadiazol-La burning diketone group. 更优选地,所述一种或多种具有至少一个在暴露于水分时水解的杂环的化合物包含含有一个或多个(oneof more)囉唑烷基的一种·或多种化合物。 More preferably, at least one of said one or more compounds which hydrolyzes when exposed to moisture comprises one heterocyclic ring having a plurality of containing one or more · (oneof more) La oxazolidinyl or more compounds. 最优选地，所述一种或多种具有至少一个在暴露于水分时水解的杂环的化合物包含含有一个或多个双.嘯唑烷基的一种或多种化合物。 Most preferably, at least one of said one or more compounds hydrolyzes when exposed to moisture-containing heterocyclic ring comprises a plurality having one or more double. One or more compounds Xiao oxazolidine groups. 所述一种或多种具有至少一个在暴露于水分时水解的杂环的化合物以足够的量存在，以提供如之后所述的异氰酸酯当量与可衍生自具有至少一个可水解杂环的一种或多种化合物的异氰酸酯反应基的当量的比率。 The one or more compounds having at least one hydrolysis when exposed to moisture in the heterocyclic ring present in an amount sufficient to provide an isocyanate equivalent weight as described later and may be derived from having one of at least one hydrolyzable heterocycle or more isocyanate reactive group equivalent ratio of the compound. 优选地，所述一种或多种具有至少一个在暴露于水分时水解的杂环的化合物以约I重量％以上、更优选2重量％以上并且最优选3重量％以上的量存在。 Preferably, at least one of said one or more compounds which hydrolyzes when exposed to moisture heterocyclic ring having more than about I wt% or more, more preferably 2 wt% and most preferably 3 wt% or more is present. 优选地，所述一种或多种具有至少一个在暴露于水分时水解的杂环的化合物以约10重量％以下、更优选7重量％以下并且最优选6重量％以下的量存在。 Preferably, at least one of said one or more compounds which hydrolyzes when exposed to moisture heterocyclic ring having a plurality of about 10 wt%, more preferably 7 wt% or less and most preferably 6 wt% or less is present. 本发明的组合物还包含溶剂。  The compositions of the present invention further comprises a solvent. 可以使用溶解或分散所述组合物的所有组分的任何溶剂。 It can be dissolved or dispersed using any solvent of the composition of all components. 优选地，溶剂在环境条件下挥发掉。 Preferably, the solvent to evaporate under ambient conditions. 优选地，溶剂具有介于约在50°C至约180°C之间的沸点。 Preferably, the solvent has a boiling point between about 50 ° C and about 180 ° C. 优选地，溶剂包括酮、酯、醚和烃。 Preferably, the solvent include ketones, esters, ethers and hydrocarbons. 更优选的溶剂包括酮和乙酸酯，并且最优选甲基乙基酮、乙酸3-甲氧基丁酯和乙酸乙酯。 More preferred solvents include ketones and acetates, and most preferably methyl ethyl ketone, acetate, 3-methoxybutyl acetate and ethyl acetate. 溶剂以足以分散或溶解本发明的其它组分的量存在。 The solvent dispersing or dissolving sufficient amount of other components of the present invention is present. 优选地，溶剂以约为35重量％以上、更优选约40重量％以上、更优选约45重量％以上并且最优选约50重量％以上的量存在。 Preferably, the solvent is about 35 wt% or more, more preferably about 40 wt%, more preferably about 45% or more by weight and most preferably from about 50 wt% or more is present. 优选地，溶剂以约为85重量％以下、更优选约75重量％以下并且最优选约70重量％以下的量存在。 Preferably, the solvent is about 85 wt%, more preferably from about 75 wt% or less by weight and most preferably about 70% or less is present. 本发明的组合物还包含对于异氰酸酯基与异氰酸酯反应基的反应而被本领域技术人员所知的一种或多种胺或有机金属聚氨基甲酸酯催化剂。  The compositions of the present invention further comprises the reaction of isocyanate groups with isocyanate-reactive groups are known to those skilled in the art, one or more amine or organometallic polyurethane catalysts. 优选地，该催化剂在环境条件下不挥发。 Preferably, the catalyst is not volatile at ambient conditions. 这样的化合物在现有技术中是熟知的。 Such compounds are well known in the prior art. 优选的催化剂包括有机金属化合物，基于胺的催化剂，或者它们的混合物。 Preferred catalysts include organometallic compounds, amine-based catalyst, or a mixture thereof. 优选地，使用有机金属化合物和基于胺的催化剂的混合物。 Preferably, a mixture of the organometallic compound and amine-based catalysts. 在优选的有机金属催化剂中的是金属链烷酸盐、金属乙酸盐和金属乙酰丙酮化物。 In preferred organometallic catalysts are metal alkanoates, metal acetates, and metal acetylacetonates. 优选的金属链烷酸盐催化剂包括铋、锌、钾和钠链烷酸盐，如辛酸铋、新癸酸铋、辛酸锌、辛酸钾和辛酸钠。 Preferred metal alkanoate catalysts include bismuth, zinc, potassium and sodium alkanoates, such as bismuth octoate, bismuth neodecanoate, zinc octoate, potassium octoate, and sodium octoate. 金属乙酸盐包括乙酸钾。 Metal acetate comprises potassium acetate. 金属乙酰丙酮化物包括乙酰丙酮化铁和二乙酰丙酮二丁基锡。 Metal acetylacetonates include iron acetylacetonate and dibutyltin diacetylacetonate. 优选的金属盐催化剂含有铋或锡作为金属，并且最优选锡。 Preferred metal salt catalysts contain bismuth or tin as the metal, and most preferably tin. 优选的胺催化剂包括二吗啉基二烷基醚、二(( 二烷基吗啉基)烷基)醚、双-(2-二甲基氨基-乙基)醚、三亚乙基二胺、五甲基二亚乙基三胺、N，N-二甲基环己胺、N，N-二甲基哌嗪4-甲氧基乙基吗啉、N-甲基吗啉、N-乙基吗啉，和它们的混合物。 Preferred amine catalysts include dimethyl dialkyl ether morpholinyl, di ((dialkylmorpholino) alkyl) ether, bis - (2-dimethylamino - ethyl) ether, triethylenediamine, pentamethyl-diethylene triamine, N, N- dimethyl cyclohexylamine, N, N- dimethyl-piperazin-4-methoxy-ethylmorpholine, N- methyl morpholine, N- ethyl morpholine, and mixtures thereof. 优选的二吗啉基二烷基醚为二吗啉基二乙基醚。 It preferred dimorpholino dialkyl ether dimorpholino-diethyl ether. 优选的二(( 二烷基-吗啉基)烷基)醚为(二-(2-(3,5-二甲基吗啉基)乙基)醚)。 A preferred di ((dialkyl - morpholinyl) alkyl) ether is a (two - (2- (3,5-dimethyl-morpholino) ethyl) ether). 叔胺以足以催化异氰酸酯基与异氰酸酯反应基的反应的量使用。 In an amount sufficient to catalyze the tertiary isocyanate groups with isocyanate reactive groups in the reaction used. 基于本发明的组合物的重量，以优选约0.15重量份以上并且最优选约0.2重量份以上的量使用叔胺。 Based on the weight of the composition of the present invention, preferably from about 0.15 parts by weight or greater and most preferably about 0.2 parts by weight of a tertiary amine. 基于本发明的组合物的重量，以优选约2.0重量份以下、更优选约1.75重量份以下、再更优选约1.0重量份以下并且最优选约0.4重量份以下的量使用叔胺。 Based on the weight of the composition of the present invention, preferably from about 2.0 parts by weight or less, more preferably about 1.75 parts by weight or less, and still more preferably about 1.0 parts by weight or less and most preferably about 0.4 parts by weight of a tertiary amine. 基于有机金属化合物的催化剂在使用时，基于本发明的组合物的重量，以优选约O重量份以上，更优选约0.01重量份以上并且最优选约0.02重量份以上的量使用。 Catalysts based on an organometallic compound in use, based on the weight of the composition of the present invention, preferably from about O to parts by weight or more, more preferably about 0.01 parts by weight or greater and most preferably of from about 0.02 parts by weight to use. 基于粘合剂组合物的重量，以优选约5重量份以下，更优选约2.0重量份以下，再更优选约I重量份以下并且最优选约0.6重量份以下的量使用这种基于有机金属化合物的催化剂。 Based on the weight of the adhesive composition, preferably about 5 parts by weight or less, more preferably about 2.0 parts by weight or less, still more preferably from about I parts by weight or less and most preferably about 0.6 parts by weight or less based on the use of such an organic metal compound catalyst. 本发明的·组合物还可以包含一种或多种成膜性树脂。  - compositions of the invention may further comprise one or more film-forming resins. 该成膜性树脂优选为高分子量树脂。 The film-forming resin is preferably a high molecular weight resin. 该成膜性树脂存在的目的是形成膜，所述膜当沉积在基底的表面上时，对本发明的组合物提供强度。 The object of the present film-forming resin is formed into a film, when the film is deposited on the surface of the substrate, the composition of the present invention to provide strength. 可以使用在溶剂蒸发时形成膜的任何高分子量树脂。 Any high molecular weight resin may be used to form a film upon evaporation of the solvent. 该高分子量树脂可以具有与(into)粘合剂体系反应或与基底的表面反应的官能团。 The high molecular weight resin may have a functional group reactive with the surface of the substrate or the reaction with (INTO) adhesive system. 备选地，反应性官能团对于使该高分子量树脂在本发明的组合物中起作用并不是必需的。 Alternatively, the reactive functional group so that the high molecular weight resin to work in the compositions of the present invention is not necessary. 优选的成膜性树脂的实例是含有一种或多种包含下列各项的官能团的树脂:乙烯基、丙烯酸酯基、苯乙烯基、二烯基、甲基丙烯酸酯基、烯丙基、亚硫醇(thiolene)、乙烯基醚、不饱和酯、酰亚胺、N-乙烯基、含丙烯酰胺的基团和它们的混合物等。 Examples of preferred film-forming resin contains one or more of a resin comprising the following functional groups: vinyl, acrylate group, a styryl group, a diene group, a methacrylate group, an allyl group, an alkylene thiol (thiolene), vinyl ether, unsaturated ester, imide, N- vinyl, acrylamide containing groups, and mixtures thereof and the like. 优选的官能团为丙烯酸酯官能团。 Preferred functional groups are acrylate functional groups. 该树脂优选具有在溶剂蒸发时促进形成坚固的膜的分子量。 The resin preferably has a molecular weight of promoting formation of a strong film upon evaporation of the solvent. 优选地，该高分子量树脂具有约5，000以上，更优选约10，000以上并且最优选约15，000以上的重均分子量。 Preferably, the resin has a molecular weight of about 5,000 or more, more preferably about 10,000 or more and most preferably above about 15,000 weight average molecular weight. 优选地，该高分子量树脂具有约200，000以下，更优选约150，000以下并且最优选约100，000以下的重均分子量。 Preferably, the resin has a molecular weight of about 200,000 or less, more preferably about 150,000 or less, and most preferably a weight-average molecular weight of about 100,000 or less. 该成膜性树脂以足够在基底上形成膜的量存在。 The film forming resin in an amount sufficient to form a film on the substrate is present. 优选地，该成膜性树脂以约O重量％以上并且最优选约I重量％以上的量存在。 Preferably, the film forming resin and most preferably from about I wt% or more is present in an amount of from about O wt% or more. 优选地，该成膜性树脂以约8重量％以下并且最优选约3重量％以下的量存在。 Preferably, the film forming resin is present in an amount from about and 8% by weight and most preferably from about 3 wt% or less. 本发明的组合物可还可以包含一种或多种增强填料例如炭黑，以对该组合物赋予所期望的颜色、粘度和抗流挂性。  The compositions of the invention may also contain one or more reinforcing fillers such as carbon black to the composition to impart the desired color, viscosity and sag resistance. 一种或多种增强填料可被用于该组合物中并且优选为一种或多种炭黑。 One or more reinforcing fillers may be used in the composition, and preferably one or more carbon blacks. 本发明中使用的炭黑可以是标准炭黑，所述标准炭黑未经特殊处理以使其是非导电的。 Carbon black used in the present invention may be a standard carbon black, said carbon black standard without special treatment to make it non-conductive. 标准炭黑是未经特殊表面处理或氧化的炭黑。 Standard carbon black is carbon black without special surface treatment or oxidation. 一种或多种非导电炭黑可以与标准炭黑结合使用，尽管这种包含可能增加非必需的成本。 One or more non-conductive carbon black may be used in conjunction with standard carbon black, although such increases may contain non-essential costs. 组合物中的炭黑的量为提供达到所期望的颜色、粘度和抗流挂性的量。 Amount of carbon black in the composition to provide an amount of hanging of the desired color, viscosity and resistance to flow is achieved. 基于组合物的重量，优选以约O重量％以上，更优选约2重量％以上并且最优选约4重量％以上的量使用炭黑。 An amount of 4% by weight or more and most preferably about carbon black-based weight of the composition, more preferably from about O wt%, more preferably about 2 wt.% And more. 基于组合物的重量，优选以约20重量％以下，更优选约15重量％以下并且最优选约12重量％以下的量使用炭黑。 And most preferably about 12% or less by weight of carbon black by weight of the composition, preferably from about 20 wt%, more preferably from about 15 wt% or less based. 标准炭黑是本领域中所熟知的，并且包括可由Colombian得到的RAVEN™ 790、RAVEN™ 450、RAVEN™ 500,RAVEN™ 430,RAVEN™ 420 和RAVEN™ 410 炭黑，以及可由Cabot 得到的CSX™ 炭黑，以及可由Degussa得到的PrinteXTM30炭黑。 Standard carbon blacks are well known in the art, and include, obtained by Colombian RAVEN ™ 790, RAVEN ™ 450, RAVEN ™ 500, RAVEN ™ 430, RAVEN ™ 420 and RAVEN ™ 410 carbon black, and obtained by Cabot CSX ™ carbon black, carbon black and PrinteXTM30 obtained from Degussa. 非导电炭黑是本领域中所熟知的，并且包括可由Colombian 得到的Raven™ 1040 和RAVEN™ 1060 炭黑。 Non-conductive carbon black are well known in the art and include Raven ™ 1040 and RAVEN ™ 1060 carbon black obtained by Colombian. 本发明的组合物还可以含有当被紫外线照射时发荧光的组分。  The compositions of the invention may further contain, when irradiation with ultraviolet rays fluorescent component. 发荧光组分容易地由多种来源得到，如威斯康星州密尔沃基的Aldrich Chemical C0.。 Fluorescent component made from a variety of readily available sources, Milwaukee, Wisconsin as Aldrich Chemical C0 .. 作为具体实例，该发荧光组分可以是可从纽约(USA)的Tarrytown的Ciba Specialty Chemicals得到的UvitexOB商标荧光剂。 As a specific example, the fluorescing component can be a fluorescent agent UvitexOB trademarks available from New York (USA) in Tarrytown, Ciba Specialty Chemicals. 加入到底漆中的荧光剂的量必须足够使得当用紫外线照射窗时，经底漆处理的窗的区域是显而易见的。 An amount of a fluorescent agent was added to the primer must be sufficient so that the window, when irradiated with ultraviolet rays, a primer treatment region by a window will be apparent. 本发明的组合物还可以包含稳定量的有机亚磷酸盐(酯)。 The compositions of the invention may further comprise a stabilizing amount of organic phosphites (esters). 该有机亚磷酸盐(酯)优选以足以加强粘合剂组合物与基底表面的粘合的耐久性的量存在。 The organic phosphites (esters) is preferably an amount sufficient to strengthen the durability of the adhesive composition adhered to the substrate surface is present. 在一个优选的实施方案中，本发明的组合物包括光稳定剂。 In a preferred embodiment, the compositions of the present invention comprises a light stabilizer. 可以使用任何光稳定剂，所述光稳定剂促进所述系统保持对其所粘合的基底的耐久粘合，历时所述结构的寿命的显著部分。 It can be any light stabilizer, a light stabilizer promote significant portion of the system to maintain its bonding durability of the bonded substrate, over the life of the structure. 在另一个优选的实施方式中，本发明的组合物还包含紫外线吸收剂。 In another preferred embodiment, the compositions of the invention further comprises an ultraviolet absorber. 任何加强粘合剂与基底的粘合耐久性的紫外线吸收剂均可使用。 Any bonding durability of adhesive to the substrate to strengthen the UV absorber may be used. 优选的紫外线吸收剂包括二苯酮和苯并三唑。 Preferred ultraviolet absorbers include benzotriazole and benzophenone. 这样的添加剂在美国专利公开2006-0124225中有描述，所述美国专利通过引用结合在此。 Such additives are described in U.S. Patent No. 2006-0124225 discloses the U.S. Patent incorporated by reference herein. 0.8: 1.0以上，再更优选约0.9: 1.0以上，再更优选约1.0: 1.0以上并且最优选约1.05: 1.0以上。 0.8: 1.0 or more, still more preferably from about 0.9: 1.0 or more, still more preferably from about 1.0: 1.0 or more and most preferably about 1.05: 1.0 or more. 优选地，该比率为约`1.5: 1.0以下，更优选约1.3: 1.0以下并且最优选约1.2: 1.0以下。 Preferably, the ratio is from about `1.5: 1.0 or less, and more preferably from about 1.3: 1.0 or less and most preferably about 1.2: 1.0 or less. 而且，存在的异氰酸酯基与衍生自一种或多种具有至少一个当暴露于水分时水解的杂环的化合物的异氰酸酯反应基的当量数的比率为优选约0.8:1.0以上，更优选约1.0: 1.0以上并且最优选约1.5: 1.0以上。 Moreover, the presence of isocyanate groups derived from the isocyanate compound of one or more hydrolyzed at least one when exposed to moisture heterocycle reaction ratio of the number of equivalents of base is preferably about 0.8: 1.0, more preferably from about 1.0: 1.0 or more and most preferably about 1.5: 1.0 or more. 存在的异氰酸酯基与衍生自一种或多种具有至少一个当暴露于水分时水解的杂环的化合物的异氰酸酯反应基的当量数的比率为优选约5.3: 1.0以下，更优选约5.0: 1.0以下；再更优选约2.7: 1.0以下并且最优选约1.7: 1.0以下。 Presence of isocyanate groups derived from the ratio of the number of equivalents of one or more isocyanate-reactive compounds are hydrolyzed at least one when exposed to moisture heterocyclic ring is preferably from about 5.3: 1.0 or less, and more preferably from about 5.0: 1.0 ; still more preferably from about 2.7: 1.0 or less and most preferably about 1.7: 1.0 or less. 在最优选的实施方案中，存在的异氰酸酯基与衍生自一种或多种具有至少一个当暴露于水分时水解的杂环的化合物的异氰酸酯反应基的当量数的比率为优选约1.5至约1.7。 In a most preferred embodiment, the presence of isocyanate groups derived from the ratio of the number of equivalents of one or more isocyanate-reactive compounds are hydrolyzed at least one when exposed to moisture heterocyclic ring is preferably from about 1.5 to about 1.7 . 如果该比率过低，则该组合物将不很好地连接到基底，而如果该比率过高，则该组合物将不表现出长开放时间。 If the ratio is too low, the composition will not be well connected to the substrate, whereas if the ratio is too high, the composition will not exhibit long open time. 本发明的组合物含有优选约I重量％以上并且更优选2重量％以上的烷氧基硅烷。 The compositions of the invention preferably contains from about I wt% and more preferably more than 2% by weight of an alkoxysilane. 本发明的组合物含有优选10重量％以下并且优选4重量％以下的烧氧基娃烧基。 The compositions of the invention preferably contains 10 wt% or less and preferably 4 wt% or less burn baby burn-yl group. 该组合物是通过将各组分在溶剂中接触并混合以形成溶液或分散体而制备的。  The composition is prepared by contacting and mixing the components in a solvent to form a prepared solution or dispersion. 优选在无水分的环境中进行所述混合，以防止异氰酸酯基和烷氧基硅烷基的过早反应。 The mixing is preferably carried out in a moisture-free environment to prevent premature reaction of the isocyanate group and the alkoxysilane group. 本发明的体系可以使用具有选自丙烯酸，甲基丙烯酸，异氰酸酯，甲硅烷氧基或它们的混合物的一个或多个官能团的任何粘合剂，所述粘合剂设计用于粘合到塑料、金属、涂布金属、玻璃、复合材料等。  The system of the present invention may be used selected from acrylic acid, a methacrylic any adhesive, isocyanate, siloxy or mixtures thereof or more functional groups, which is designed for adhesive bonding to plastic, metal, coated metal, glass, composite materials and the like. 优选的粘合剂体系为具有异氰酸酯基、甲硅烷氧基或异氰酸酯与甲硅烷氧基的组合的粘合剂。 Preferred adhesive systems having isocyanate groups, siloxy or adhesive in combination with an isocyanate silyl group. 最优选的是具有异氰酸酯基或异氰酸酯和甲硅烷氧基的粘合剂体系。 Most preferred is an isocyanate having an isocyanate group or a siloxy and binder system. 具有异氰酸酯基或具有异氰酸酯和甲硅烷氧基的优选粘合剂体系的实例公开在美国专利4，374，237、美国专利4，687，533、美国专利4，780，520、美国专利5，063，269、美国专利5，623，044、美国专利5，603，798、美国专利5，852，137、美国专利5，976，305、美国专利5，852，137、美国专利6，512，033相关部分中，所述美国专利通过引用结合在此。 Examples of isocyanate having an isocyanate group or a silyl group, and preferred adhesive systems are disclosed in U.S. Patent No. 4,374,237, U.S. Patent No. 4,687,533, U.S. Patent No. 4,780,520, U.S. Patent No. 5,063 , 269, US Patent 5,623,044, US Patent 5,603,798, US Patent 5,852,137, US Patent 5,976,305, US Patent 5,852,137, US Patent 6,512,033 in relevant part, the U.S. Patent incorporated by reference herein. 用于本发明的聚异氰酸酯官能粘合剂通常包含具有异氰酸酯官能度的预聚物，用于所述预聚物的固化的催化剂和本领域技术人员熟知的其它添加剂。 The polyisocyanate functional adhesives useful in the present invention generally comprise a prepolymer having isocyanate functionality, other additives used in the curing of the prepolymer and catalysts well known to the skilled person. 在本发明中使用的预聚物可以是在聚氨基甲酸酯粘合剂组合物中使用的常规预聚物。 The prepolymer used in the present invention can be conventional prepolymers used in polyurethane adhesive compositions. 在一个优选的实施方案中，将该预聚物与具有硅烷官能度的化合物或聚合物共混。 In a preferred embodiment, the prepolymer or polymer blend with a compound having silane functionality. 在另一个优选的实施方案中，该预聚物含有硅烷官能度以及异氰酸酯官能度。 In another preferred embodiment the prepolymer contains silane functionality as well as isocyanate functionality. 具有硅烷官能度的氨基甲酸乙酯预聚物可用作在粘合剂中使用的的整个预聚物，或可以将其与不具有硅烷官能度的预聚物共混。 Having silane functionality may be used as the urethane prepolymer entire prepolymer used in the adhesive, or may be blended with a prepolymer which does not have silane functionality pre. 在一个实施方案中，本发明的粘合剂组合物含有具有挠性主链并且能够硅烷醇缩聚的硅烷部分的聚合物。 In one embodiment, the adhesive composition of the present invention contains a polymer having a flexible backbone and silane moieties capable of silanol condensation. 具有挠性主链的聚合物可以为任何具有可以被能够硅烷醇缩聚的硅烷官能化的挠性主链的聚合物。 A polymer having a flexible backbone can be any polymer having may be capable of silanol condensation silane-functionalized flexible backbone. 优选的聚合物主链为聚醚、聚氨酯、聚烯烃等。 The preferred polymer backbone is a polyether, polyurethane, polyolefins and the like. 更优选的聚合物主链为聚醚和聚氨酯，并且最优选聚醚。 More preferably, the polymer backbone is a polyether and polyurethane, and most preferably a polyether. 这样的粘合剂组合物的实例为在Mahdi，US2002/01550 Al中公开的那些。 Examples of such adhesive compositions are those disclosed in Mahdi, US2002 / 01550 Al in. 再更优选地，聚合物为具有能够硅烷醇缩聚的硅烷部分的聚醚。 Even more preferably, the polymer is a polyether having silane moieties capable of silanol condensation. 在一些实施方案中，用于本发明的聚合物为Yukimoto等在美国专利4，906, 707 ； Iwakiri等在美国专利5，342，914 ；Yukimoto在美国专利5, 063, 270 ；Yukimoto等在美国专利5, 011, 900 ;或Suzuki等在美国专利5，650，467中公开的聚合物，所述美国专利通过引用结合在此。 In some embodiments, the polymer used in the present invention are Yukimoto et al U.S. Patent No. 4,906, 707; Iwakiri et al U.S. Patent 5,342,914; Yukimoto in U.S. Patent No. 5, 063, 270; Yukimoto et al U.S. Patent 5, 011, 900; Suzuki, or other polymers disclosed in U.S. Patent No. 5,650,467, the U.S. Patent incorporated by reference herein. 更优选地，这样的聚合物为每分子含有至少一个反应性硅基团的氧化烯聚合物。 More preferably, such polymers containing per molecule at least one oxyalkylene polymer having a reactive silicon group. 术语“甲硅烷氧基”、“反应性硅基团”或“能够硅烷醇缩聚的反应性硅烷”是指含硅基团，在该含硅基团中可水解基团或羟基连接于硅原子，并且该含硅基团通过硅烷醇缩合反应是可交联的。 The term "silyl group", "reactive silicon group" or "capable of silanol condensation of reactive silane" refers to silicon-containing groups, silicon-containing groups in the hydrolyzable groups or hydroxyl groups attached to the silicon atom and the silicon-containing groups by silanol condensation reaction crosslinkable. 该可水解基团不受具体限制并且选自常规的可水解基团。 The hydrolyzable group is not particularly limited and may be selected from conventional hydrolyzable groups. 具体的实例为氢原子、卤素原子、烷氧基、酰氧基、酮肟基(ketoximate group)、氨基、酰氨基、酰胺基(acid ami do group)、氨基氧基、巯基和烯氧基。 Specific examples are a hydrogen atom, a halogen atom, an alkoxy group, an acyloxy group, a ketoxime group (ketoximate group), an amino group, an acylamino group, an amide group (acid ami do group), an amino group, a mercapto group and an alkenyloxy group. 在这些选择中优选为氢原子、烷氧基、酰氧基、酮肟基、氨基、酰氨基、氨基氧基、巯基和烯氧基。 These choices is preferably a hydrogen atom, an alkoxy group, an acyloxy group, a ketoxime group, an amino group, an acylamino group, an amino group, a mercapto group and an alkenyloxy group. 由于其温和的可水解性而易于处理，因此更优选烷氧基，最优选为甲氧基或乙氧基。 Because of its mild hydrolyzability and easy handling, alkoxy groups are more preferred, and most preferably methoxy or ethoxy. 可以将I至3个羟基或可水解基团结合到一个硅原子。 I to 3 hydroxyl groups or hydrolyzable groups may be bonded to a silicon atom. 在相对于每个反应性硅基团存在两个以上的羟基或可水解基团的情况下，所述羟基或可水解基团可以相同或不同。 In the presence of two or more hydroxyl or hydrolyzable groups in each reactive silicon group relative to the hydroxyl or hydrolysable groups may be the same or different. 该反应性硅基团可具有一个或多个硅原子。 The reactive silicon group may have one or more silicon atoms. 本发明的组合物可以用作多种基底的底漆，所述基底例如为具有高和/或低表面能的塑料、片状模塑料、复合材料、涂布金属、玻璃和木材。 The composition  The present invention can be used as a primer to a variety of substrates, for example, the substrate having a high and / or low surface energy plastics, sheet molding compound, composite materials, coated metals, glass and wood. 本发明的组合物可用于组装相同材料的基底以及所述材料的任何组合物的基底。 The compositions of the invention may be used to assemble the same substrate material and any substrate material of the composition. 本发明的组合物优选用于将低表面能塑料基底与另一个或与其它种类的基底粘合。 Preferred compositions of the present invention for low surface energy plastic substrate with another substrate, or other kinds of pressure-sensitive adhesive. 在一个优选的实施方案中，可以将一种或多种具有低表面能的基底粘合于一种或多种不具有低能表面或具有闻能量表面的基底。 In a preferred embodiment, the one or more substrates having low surface energy may be bonded to one or more substrates having no or low energy surfaces having a surface energy of the smell. 在另一个实施方案中，该基底为片状模塑料，并且这样的表面可粘合于任何其它种类的基底。 In another embodiment, the substrate is a sheet molding compound, and such a surface can be bonded to any other type of substrate. 当使用低表面能塑料时，该低表面能塑料的表面可以在涂敷本发明的组合物之前经表面处理。 When a low-energy plastic surface, the low surface energy surface of the plastic surface may be treated prior to application of the composition according to the present invention. 可以利用增加塑料表面上存在的极性基团的数量的任何已知表面处理手段，包括火焰处理、电晕放电、化学蚀刻等。 Surface treatment may be by any known means of increasing the number of polar groups present on the plastic surface include flame treatment, corona discharge, chemical etching or the like. 通常，将基底粘合在一起的方法包含将本发明的组合物与基底表面接触并且允许本发明的组合物的溶剂挥发掉。 Method  Generally, the substrates together comprising contacting the composition with the substrate surface of the present invention and allow the composition of the present invention to evaporate the solvent. 其后，沿基底的与一个或多个其它基底粘合的部分，将合适的粘合剂涂敷到基底的表面上。 Thereafter, along with one or more substrates bonded portion of the other substrate, a suitable adhesive is applied onto the surface of the substrate. 粘合剂其后与第二基底接触，使得粘合剂布置在基底之间。 Thereafter contacting the substrate with a second adhesive, such an adhesive disposed between the substrates. 允许所述粘合剂固化以形成基底之间的持久结合。 Allowing the adhesive to cure to form a durable bond between the substrates. 本发明的组合物可以通过本领域中所熟知的任何手段涂敷。  The compositions of the invention may be well known in the art by any means is applied. 其可以通过下列方法手工涂敷:对要涂敷粘合剂的基底的表面刷涂，辊涂或涂敷含有所述组合物的布，使得将足够量的本发明的组合物涂敷到所述表面上。 Which can be manually applied by the following method: applying an adhesive to the surface of a substrate by brush, roller or coating composition comprising the fabric, such that the compositions of the present invention is applied to a sufficient amount of the said upper surface. 优选地，使用机器(robot)来涂敷该组合物。 Preferably, the machine (Robot) to the coating composition. 用于此操作的机器为例如可由密歇根州Rochester Hills的Fanuc Robotics America得到的M710I,其与由俄亥俄州Amherst的Nordson Corporation提供的自动底漆分配涂敷器一起使用。 A machine for this operation, for example, of Rochester Hills, Michigan M710I Fanuc Robotics America may be obtained, a primer for use with automatic dispensing applicator provided by Amherst, Ohio, Nordson Corporation. 涂敷该组合物，使得在涂底漆以后存在至少约8至约15秒的干燥时间。 The composition is applied, so that the presence of a drying time of at least about 8 to about 15 seconds after priming. 优选地，在涂敷该组合物后至少20秒使用粘合剂。 Preferably, the composition is applied after at least 20 seconds using an adhesive. 该组合物以足以形成相干膜的量涂敷。 The composition was applied in an amount sufficient to form a coherent film. 优选地，在溶剂挥发以后，该膜表现出约I微米以上，更优选约3微米以上并且最优选约5微米以上的厚度。 Preferably, after evaporation of the solvent, the film exhibits greater than about I micron, or more and more preferably about 3 micrometers and most preferably greater than about 5 microns. 优选地，在溶剂挥发以后，该膜表现出约20微米以下，更优选约16微米以下并且最优选14微米以下的厚度。 Preferably, after evaporation of the solvent, the membrane exhibits about 20 microns or less, and more preferably a thickness of about 16 microns or less and most preferably 14 microns or less. 在一些实施方案中，在涂敷本发明的组合物之后不久即将粘合剂组合物涂敷到基底上。  In some embodiments, after application of the composition according to the present invention, the adhesive composition will soon be applied to a substrate. 在涂敷本发明的组合物与涂敷粘合剂之间的最短时间为足以使溶剂挥发掉所必需的时间。 The minimum time between application of the composition according to the present invention with the coating binder is sufficient to evaporate the solvent and the time necessary. 在一些实施方案中，可以在与涂敷本发明的组合物的场所不同的场所中涂敷粘合剂，如在工厂的不同部分或不同工厂中。 In some embodiments, the adhesive may be applied in place of the composition of the present invention is coated in a different location, such as in different parts of the plant or a different plant. 此外，该工厂可相距若干英里，如相距几百或几千英里。 Furthermore, the plant can be many miles apart, such as hundreds or thousands of miles apart. 可以在比涂敷本发明的组合物迟得多的时间涂敷粘合剂组合物。 The adhesive composition may be applied in the coating compositions of the present invention over a much later time. 在于表面上涂敷本发明的底漆组合物和涂敷粘合剂之间的时期，可以为其中本发明的底漆组合物仍能够连接到粘合剂的任何时期。 That the period between the coating and the primer composition is applied on the surface of the adhesive of the present invention, which may be a primer composition of the present invention is still able to connect to the adhesive at any time. 在一些实施方案中，在涂敷本发明的组合物和涂敷粘合剂组合物之间的时间可以为优选约5天以上，更优选30天以上，再更优选约3个月(90天)以上，再更优选约9个月以上并且最优选为直至约I年。 In some embodiments, the time between application of the adhesive compositions and coating compositions of the present invention may be preferably about 5 days, more preferably at least 30 days, even more preferably about 3 months (90 days ) or more, and still more preferably about 9 months and most preferably up to about I years. 涂敷本发明的组合物与涂敷粘合剂组合物之间的时期可以为约I年以下，更优选约9个月以下并且更加优选约90天以下，并且优选约60天以下。 The composition of the present invention is applied and the period between the application of the adhesive composition may be from about I year or less, more preferably about 9 months or less and more preferably about 90 days or less, and preferably about 60 days or less. 一种用于对窗涂敷底漆的方法，所述方法包括以下步骤:(a)将光引导到窗上以照射基底的一部分；(b)沿所述窗的经照射部分涂敷本发明的组合物。  A method for window coating primer, said method comprising the steps of: (a) irradiating light onto a portion of the substrate to the windows; irradiated part (b) of the window coating along dressing compositions of the present invention. 如果该组合物含有蒸发的组分，则所述方法还可以包括下列步骤:随着所述组分蒸发而形成基底的红外图像，以指示所述组合物的涂敷区域。 If the composition containing components evaporated, the method may further comprise the steps of: an infrared image is formed as the base component evaporates to indicate the area of ​​the coating composition. 如果该组合物含有当被紫外线照射时发荧光的组分，则该方法还可以包括步骤:用紫外线照射基底，以指示所述组合物的涂敷区域。 If the composition contains, when irradiation with ultraviolet rays fluorescent components, the method may further comprise the step of: irradiating the substrate with ultraviolet rays, to indicate that the composition of the coating region. 这些方法可以如在以下内容中所公开的而进行:共同转让的美国专利公布2003/0232152A1和2003年6月11日提交的PCT申请WO 2003/106579，所述专利通过引用结合在此(W0 03/19745)。 These methods can be carried out as disclosed in the following content: in commonly assigned US Patent Publication PCT 2003 / 0232152A1 and 2003 June 11 filed WO 2003/106579, which is incorporated by reference herein (W0 03 / 19745). 将粘合剂组合物涂敷到基底上，并且在第一基底上的粘合剂其后与第二基底接触。  The adhesive composition is applied to a substrate, and the adhesive on the first substrate is thereafter contacted with a second substrate. 其后，将粘合剂暴露于固化条件。 Thereafter, the adhesive is exposed to curing conditions. 在一个优选的实施方案中，一个基底是低表面能塑料，而另一个基底为塑料、金属、玻璃纤维或复合材料基底，其可以任选被上漆。 In a preferred embodiment, the substrate is a low surface energy plastic and the other substrate is a plastic, metal, fiberglass or composite substrate which may optionally be painted. 通常，该底漆与粘合剂在环境温度、在大气水分的存在下涂敷。 Typically, the primer and adhesive at ambient temperature, in the presence of atmospheric moisture in the coating. 对于大气水分的暴露足以导致粘合剂的固化。 For exposure to atmospheric moisture is sufficient to result in curing of the adhesive. 固化可以通过下列方法进一步加速:经由对流热或微波加热对固化粘合剂施加热，和/或通过增加大气中的水分的量，例如通过使用潮湿箱。 Curing may be further accelerated by the following method: heating through convection heat or microwave heat is applied to cure the adhesive, and / or by increasing the amount of moisture in the atmosphere, for example by using a humidity chamber. 优选地，该粘合的粘合剂体系当根据下列测试进行测试时表现出下列性质。  Preferably, the bonding adhesive system exhibits the following properties when tested according to the following test. 优选地，当与经火焰处理的聚丙烯粘合时，在暴露于如之后所述的泥罨(cataplasma)测试以后，本发明的粘合体系表现出大于约75%的内聚破坏，粘合剂的涂敷发生在涂敷本发明的组合物以后约90天时。 Preferably, when the polypropylene flame treated with an adhesive by, after exposure to the poultice as described later (cataplasma) test, the adhesive system of the present invention exhibit greater than about 75 percent of cohesive failure, the adhesive coating agent occurs after application of the composition according to the present invention is about 90 days. 优选地，本发明的粘合体系根据之后定义的方法展现出约50N/cm以上并且更优选约60N/cm以上的t-剥离强度(t-peel strength),其中粘合剂的涂敷发生在涂敷本发明的组合物以后约28天时。 Preferably, the adhesive system of the present invention exhibit about 50N / cm or more after The method as defined above and more preferably from about 60N / cm t- peel strength (t-peel strength), wherein the adhesive is applied occurs the composition of the present invention is applied after about 28 days. 所列出的与本发明的组合物有关的组分的所有百分数均基于组合物的总重量。  All percentages relating to the composition of the present invention listed components are based on the total weight of the composition. 如本文中所述的分子量为数均分子量，其可由凝胶渗透色谱法(也被称为SEC)确定。 As used herein in the molecular weight number average molecular weight, which may be a gel permeation chromatography (also referred to as SEC) determined. 对于聚氨酯预聚物，还可以从如本领域技术人员已知用于反应所采用的异氰酸酯化合物和多元醇化合物的当量比计算近似的数均分子量。 For polyurethane prepolymers may also be employed are known for the reaction equivalent ratio of the isocyanate compound and the polyol compound is calculated from the approximate number average molecular weight as those skilled in the art. 除非特别说明，所有的份或百分数均以重量计并且基于粘合剂体系的重量。 Unless otherwise indicated, all parts and percentages are by weight based on the weight of the binder system. 本发明的示例性实施方案  The exemplary embodiments of the present invention. 下列实施例提供用于示例本发明，但是不意在限制其范围。  The following examples are provided to illustrate the invention but are not intended to limit its scope. 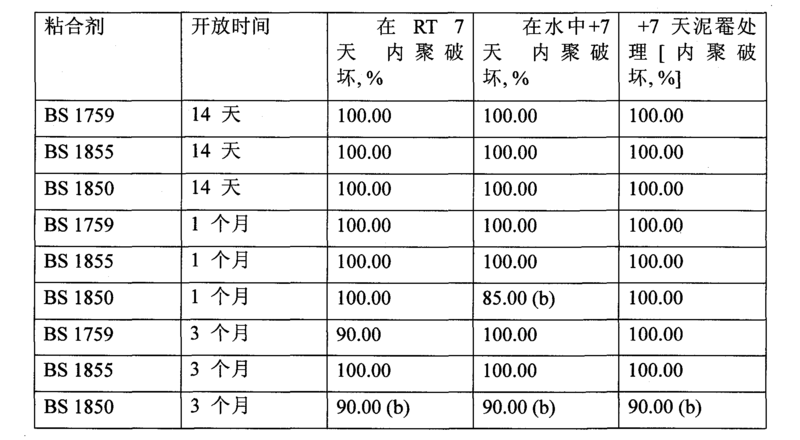 除非特别说明，所有的份和百分数均以重量计。 Unless otherwise indicated, all parts and percentages are by weight. 基底制备。  Preparation of the substrate. 根据下列测试程序对若干火焰处理的玻璃纤维增强的聚丙烯(PP)零件进行搭接剪切测试(lap shear tset)。 Lap shear tests performed (lap shear tset) according to the following test procedure several flame treated glass fiber reinforced polypropylene (PP) components. 将电泳涂布(e_coat)样品的测试表面用庚烧清洗并且用无棉绒纸干燥。 The test surface of the electrophoretic coating (e_coat) sample burned washed with heptane and dried with lint-free paper. 干燥以后，将清洁表面用底漆组合物涂敷并且允许其闪蒸15分钟。 After drying, the cleaned surface with a primer composition is applied and allowed to flash for 15 minutes. 将PP板的测试表面用庚烷清洗并且用无棉绒纸干燥。 The test surface of the PP plate was washed with heptane and dried with lint-free paper. 将干燥的PP表面暴露于火焰处理，所述火焰处理使用来自arc otec，OberflSchtechnikGmbH的ARCOGAS fts ioid仪器，在没有另外的氧加入的情况下使用空气-丙烷混合物50: 2，火焰和基底之间的距离为100mm，基底速度为600mm/s。 The dried treated PP surface is exposed to a flame, the treatment with flame, OberflSchtechnikGmbH ARCOGAS fts ioid instrument from the arc otec, in air without additional oxygen is added to the case - a mixture of propane, 50: 2, between the flame and the substrate distance of 100mm, substrate speed of 600mm / s.
 快刀粘合(quick knife adhesion)。  The sharp knife adhesion (quick knife adhesion). 在快刀粘合试验中，用标准化涂抹器将底漆涂敷在干净的塑料基底上，以获得12至13微米的均匀膜厚度。 In sharp knife adhesion test, a standardized primer applicator applied on clean plastic substrates, to obtain a uniform film thickness of 12 to 13 microns. 在15分钟的限定闪蒸时间之后，涂敷具有限定的几何形状，典型地，IOmm(高度)X 10-15mm(宽度)X 200mm(长度)的粘合剂条(bead)。 After 15 minutes flash time is defined, coated with a defined geometry, typically, IOmm (height) X 10-15mm (width) X 200mm (length) of adhesive (bead). 将该粘合剂条压缩至约6mm的高度。 The adhesive strip compressed to a height of about 6mm. 在如下所述的暴露之后，进行下列测试。 After exposure as described below, the following test. 将粘合剂条平行于基底在边缘上切割约10mm，并且以90°角度剥离。 The adhesive strips parallel to the base on the cutting edge about 10mm, and the peel angle of 90 °. 用刀将剥离的条各以约IOmm切割至基底，并且继续剥离。 Each peeling knife bar to about IOmm cut substrate, and stripping continued. 将剥离的样品以内聚破坏的百分数进行评价，含义为硬化的粘合剂块体的破坏，具体地，I =约0%的内聚破坏，I =约25%的内聚破坏，3 =约50%的内聚破坏，4 =约75%的内聚破坏，和5 =约100%的内聚破坏。 The peeled samples within the percentage of cohesive failure evaluation, meaning the destruction of the hardened adhesive mass, in particular, I = the range of about 0% cohesive failure, I = the cohesive failure of about 25%, about 3 = 50% cohesive failure, cohesive failure of about 75% = 4, and 5 = about 100% cohesive failure. 如本文中使用的，关于破坏模式百分数，标记a意味着具有或没有底漆的粘合剂表现为从基底上脱层，而b意味着粘合剂表现为从底漆脱层。 As used herein, percentages regarding failure mode, meaning a tag adhesive performance of the primer, with or without delamination from the substrate, while b means the adhesive exhibits delaminating from the primer. (I)在23°C、在50%相对湿度(Rh.) 7天，⑵加上在水中于23°C 7天，(3)在90°C 7天，和加上(4)泥罨(cataplasm)处理7天。 (I) at 23 ° C, 50% relative humidity (Rh.) 7 days ⑵ together at 23 ° C 7 days, (3) at 90 ° C 7 days in water and adding (4) poultice (cataplasm) for 7 days. 泥罨处理包括将样品用棉花包装，并且用十倍水将该棉包装饱和，继续用铝箔和聚丙烯(PE)箔包裹避免蒸发。 Poultice process comprises packing the sample with cotton and packaged with saturated aqueous times the cotton, continue with aluminum foil and polypropylene (PE) wrapped in foil to avoid evaporation. 将该包装的样品在70°C暴露7天，在-20°C暴露16小时，置于环境温度，并且将解开的样品在23°C储存2小时。 The packaged samples exposed at 70 ° C for 7 days exposure at -20 ° C 16 hours and left at ambient temperature and the unwrapped sample is stored at 23 ° C 2 hours. 剥离强度。  The peel strength. 剥离强度值通过使用例如诸如Zwick/Roell ZWART.PRO的张力试验机进行T-剥离试验而确定。 Peel strength values ​​such Zwick / Roell ZWART.PRO tensile tester T- peel test is determined by using, for example. 将塑料零件切割成3X 20cm的零件。 3X 20cm plastic parts cut parts. 清洁后，以如在快刀试验描述中所述的方式进行底漆和粘合剂涂敷。 After cleaning, a sharp knife to the test as described in the manner described in the primer and adhesive application. 将准备的样品固定在设备中，并且将样品以90°角度剥离，并且以N/cm确定剥离强度值，其中以cm计的长度为剥离的条的宽度。 The prepared samples were fixed in the apparatus, and the sample was peeled at a 90 ° angle, and in N / cm peel strength values ​​is determined, wherein the length in cm of width of the strips peeling. 将在下列实施例中使用的组合物中所用的成分描述在表I中。  The composition used in the following examples used in the composition described in Table I below. 得到的组合物显示:芳族异氰酸酯与脂族异氰酸酯的当量比为1.05，异氰酸酯基与囉唑烷的可水解当量的比率为1.62，并且硅烷为1.8重量％，并且固含量为43%。  The resulting composition exhibits: an aromatic isocyanate with an aliphatic isocyanate equivalent ratio of 1.05, an isocyanate group and La oxazolidine hydrolyzable equivalents ratio of 1.62, and a silane of 1.8 wt%, and a solids content of 43% . 底漆组合物与 BETASEAL 1759，1850，1855，LI FRB 和BS LI DCG 单组分聚异氰酸酯官能粘合剂以及BETAMATE 7160单组分聚异氰酸酯官能粘合剂的测试的结果显示(compioled)在表2-7 中。  The primer composition with BETASEAL 1759,1850,1855, and the results LI FRB BS LI DCG monocomponent polyisocyanate functional adhesive BETAMATE 7160 and a one-component polyisocyanate functional adhesive of the tests are shown (compioled) in table 2-7. BETASEAL 和BETAMATE 是陶氏化学公司(The Dow ChemicalCompany)的商标。 BETASEAL and BETAMATE are trademarks of The Dow Chemical Company (The Dow ChemicalCompany) of. 表2显示在火焰处理的玻璃纤维增强的聚丙烯上的与BETASEAL 1759粘合剂结合的本发明的组合物在15分钟的闪蒸时间、在23°C/50%相对湿度暴露7天以及泥罨处理另外7天以后的搭接剪切值(lap shear value)。  Table 2 shows the compositions of the invention in combination with BETASEAL 1759 adhesive on flame treated glass fiber reinforced polypropylene in the flash time of 15 minutes, at 23 ° C / 50% relative humidity exposure 7 days and treated poultice lap shear value (lap shear value) after an additional 7 days. 表3显示在火焰处理的玻璃纤维增强的聚丙烯上的与BETASEAL 1795粘合剂和BETAMATE 7160粘合剂结合的本发明的组合物在24小时的闪蒸时间、在23°C /50%相对湿度暴露7天、水暴露7天以及泥罨处理另外7天以后的搭接剪切值。  Table 3 shows the compositions of the invention in combination with BETASEAL 1795 adhesive and BETAMATE 7160 adhesive on flame treated glass fiber reinforced polypropylene is a flash time of 24 hours, at 23 ° C / exposure to 50% relative humidity for 7 days water exposure 7 days, and the lap shear values ​​poultice treatment for another 7 days after. 表4示例在火焰处理的聚丙烯上的与BETASEAL 1759粘合剂结合的本发明的底漆组合物在15分钟的开放时间、在23°C /50%相对湿度暴露7天并且泥罨处理另外7天以后的粘合性能的评价。  Table 4 illustrates the primer composition of this invention in combination with BETASEAL 1759 adhesive on flame treated polypropylene in 15 minutes of open time, at 23 ° C / 50% RH 7 days and exposed mud Further adhesive property was evaluated after 7 days of treatment foment. 表5示例在火焰处理的玻璃纤维增强聚丙烯上的与BETASEAL 1759粘合剂结合的本发明的组合物在2和4星期的开放时间(23°C /50% RH)以后的快刀测试结果和T-剥离测试结果。  Table 5 illustrates the glass fiber reinforced flame treatment in combination with BETASEAL 1759 adhesive composition of the present invention on a polypropylene 2 and 4 weeks in open time (23 ° C / 50% RH) after a sharp knife T- peel test results and test results. 在涂敷底漆以后2星期和4星期时，将经底漆处理的玻璃纤维增强的聚丙烯与粘合剂接触。 When the primer is applied after two weeks and four weeks after the primer treatment of the glass fiber reinforced polypropylene contact with the adhesive. 表6示例在电泳涂层上的与不同BETASEAL粘合剂结合的本发明的底漆组合物在32°C和80% RH的不同开放时间之后的快刀粘合试验结果。  Table 6 illustrates on an electrophoretic coating in combination with BETASEAL different adhesive primer composition according to the present invention a sharp knife adhesion test results at 32 ° C and after various open times and 80% RH. 表7示例在不同塑料上的与BETASEAL 1759粘合剂结合的本发明的底漆组合物在32°C和80% RH在15分钟开放时间以后的快刀粘合试验结果。  Table 7 illustrates the present invention in combination BETASEAL 1759 adhesive primer composition in different plastics adhesion test results after 15 minutes of open time of a sharp knife at 32 ° C and 80% RH. SMC为片状模塑料。  SMC is a sheet molding compound. PBT/ASA为聚对苯二甲酸丁二醇酯与丙烯酸基接枝的丙烯腈-苯乙烯乙酸酯的共混物。  PBT / ASA is a poly (butylene terephthalate) and acrylic based graft acrylonitrile - styrene blend acetate. b)约I重量％至约25重量％的一种或多种芳族聚异氰酸酯；c)约I重量％至约10重量％的一种或多种具有至少一个杂环的化合物，所述杂环在暴露于水分时水解以形成至少一个异氰酸酯反应基；d)约45重量％至约75重量％的一种或多种溶剂；e)约0.01重量％至约5重量％的一种或多种胺或有机金属聚氨基甲酸酯催化剂；f)约O重量％至约8重量％的一种或多种成膜性树脂；g)约O重量％至约20重量％的一种或多种颜料；其中，百分数基于所述组合物的总重量。 b) from about I wt.% to about 25 wt% of one or more aromatic polyisocyanates; c) from about I wt.% to about 10% by weight of at least one or more compounds having a heterocyclic ring, the hetero ring hydrolysis when exposed to moisture to form at least one isocyanate-reactive group; D) from about 45% to about 75% by weight of one or more solvents; E) from about 0.01% to about 5% by weight of one or more amines or organometallic polyurethane catalysts; F) to about O wt% to about 8% by weight of one or more film forming resins; G) from about O to about 20 wt.% wt.% of one or more pigments; wherein percentages based on the total weight of the composition. 根据组合物实施方案21的第22组合物实施方案，其中组分b)包含:i)约3重量％至约15重量％的i) 一种或多种包含聚异氰酸酯或聚合的聚异氰酸酯中的一种或多种，和约I重量％至约7重量％的ii)聚异氰酸酯与还含有烷氧基硅烷基的具有两个以上的异氰酸酯反应基的化合物的一种或多种加合物。 The composition according to embodiment 22 of the composition 21 embodiment, wherein component b) comprises: i) from about 3% to about 15 wt% of i) one or more containing polyisocyanate polyisocyanates or polymeric in one or more, about I wt.% to about 7% by weight of ii) a polyisocyanate and alkoxysilane groups also contain two or more compounds of the isocyanate reactive groups having one or more adducts. 根据组合物实施方案I至22中任一项的第23组合物，其中沉积在低能塑料的表面上的组合物能够在沉积在低能塑料的表面上以后与聚氨酯粘合剂连接长达3个月。 The composition according to embodiment I to 23 The composition of any one of 22, wherein the composition is deposited on a surface of low energy plastics can be connected with up to 3 months after the urethane adhesive is deposited on the surface of the low-energy plastic . 第24实施方案包含一种用于将两个基底粘合在一起的体系，所述体系包含根据组合物实施方案I到23中任一项的组合物和异氰酸酯官能粘合剂。  The first embodiment 24 comprises a system for bonding two substrates together, said system comprising embodiments of a composition according to compositions I and an isocyanate functional adhesive of any one of 23. 根据体系实施方案24的第25体系实施方案，其中所述异氰酸酯官能粘合剂为单组分可水分固化的粘合剂。 The system according to the embodiments of the first embodiment 25 of the system 24, wherein the isocyanate functional adhesive is a one-component moisture curable adhesive. 第26实施方案包含一种对表面涂底漆以增强聚异氰酸酯官能粘合剂与所述表面的粘合的方法，所述方法包括将根据组合物实施方案I至23中任一项所述的组合物与所述表面接触并使溶剂蒸发。  The first embodiment 26 comprises one embodiment of a surface primed to enhance any one of a polyisocyanate functional adhesive to the bonding method, the method comprising the surface a composition according to embodiment 23 Scheme I the composition contacted with the surface to evaporate the solvent. 包含根据方法实施方案26的方法的第27实施方案，其中所述表面为经表面处理的低表面能塑料。 The first embodiment 27 embodiment 26 embodiment comprising a method according to an embodiment of the method, wherein the surface is a surface treated by a low surface energy plastic. 第28实施方案包含一种将两个基底粘合在一起的方法,所述方法包括:a)将根据组合物实施方案I至23中任一项所述的组合物涂敷到所述基底中的一个或多个的表面上，并且使溶剂蒸发掉；b)将异氰酸酯官能粘合剂涂敷到根据步骤a)对其涂敷所述组合物的两个以上基底的所述表面上；c)将所述两个以上基底在所述粘合剂布置在所述基底之间的情况下接触在一起；和d)允许所述粘合剂固化，从而将所述两个以上基底粘合在一起。  The first embodiment 28 comprises one of the two substrates bonded together, said method comprising: a) a composition according to embodiment I is applied to the composition according to any one of claims 23 to the on said substrate to one or more surfaces, and the solvent was evaporated off; b) the isocyanate functional adhesive to step a) of the coated surface of the substrate two or more thereof according to the composition a; c) the two or more substrates together with the adhesive in a case where the contact is disposed between the substrate; and d) allowing the adhesive is cured, whereby the two or more substrates bonded together. 第29实施方案包含根据方法实施方案28的方法，其中所述基底的至少一个是经表面处理的低表面能塑料。 The first embodiment 29 embodiment 28 embodiment comprising the methods of the embodiments, wherein the at least one substrate by a low surface energy plastic surface treated. 根据方法实施方案28或29的第30方法实施方案，其中所述底漆的涂敷至所述粘合剂的涂敷之间的时间为约20秒至约3个月。 According to the methods 30 or embodiment 28 embodiment 29, wherein the time between applying the primer coating to the binder is from about 20 seconds to about 3 months. 根据方法实施方案28至30中任一项的第31实施方案， 其中至少一个基底为经表面处理的低表面能塑料，而另一个基底不是低表面能塑料。 31 embodiment of the method according to any one of embodiments 28 to 30, wherein the at least one substrate is a surface treated by a low surface energy plastic and the other substrate than the low surface energy plastics. 根据方法实施方案28至31中任一项的第32实施方案，其中在步骤a)之后，将所述基底中的一个或多个移动到用于进行步骤b)的另一个位置。 32 embodiment of the method according to any one of embodiments 28 to 31, wherein in step a), one or more of the substrate to move for performing step b) another location. 第33实施方案包含一种制品，所述制品包括基底，所述基底在其上沉积有组合物实施方案I至23的组合物。  The first embodiment 33 comprises one article, said article comprising a substrate, the substrate on which the composition is deposited with a composition of embodiments I to 23. 第34实施方案包含根据制品实施方案33的制品，其中已经从沉积在基底上的组合物中挥发掉溶剂。 The first embodiment 34 comprising the article of embodiment 33 of the article, which has evaporated from the deposition on the substrate in the solvent composition. 第35实施方案包含根据制品实施方案33或34的制品，其中基底中的至少一个为经表面处理的低表面能塑料。 The first embodiment 35 comprises article according to article embodiment 33 or embodiment 34, wherein at least one of a surface treated low surface energy plastic substrate. 第36实施方案包含根据制品实施方案35的制品，其中其它基底中的至少一个(at least on)不是经表面处理的低表面能塑料。 The first embodiment 36 comprises article 35, the lower surface of the substrate wherein the at least one other (at least on) can not surface treated plastic article according to the embodiment. 第37实施方案中包含一种制品，所述制品包括基底，所述基底在其上沉积有:没有溶剂的组合物实施方案I至23的组合物。 The first embodiment 37 comprises one article, said article comprising a substrate, said substrate having deposited thereon: no composition of embodiments I to the composition of the solvent 23. 第38实施方案包含根据制品实施方案37的制品，其中所述基底中的至少一个为经表面处理的低表面能塑料。 The first embodiment 38 comprises article according to article embodiment 37 wherein at least one surface treated low surface energy of the plastic substrate. 第39实施方案包含根据制品实施方案38的制品，其中其它基底中的至少一个(at least on)不是经表面处理的低表面能塑料。 39 embodiment 38 embodiment comprising an article, wherein at least a lower surface (at least on) other than the substrate can be surface treated plastic article according to the embodiment. 1.一种组合物，所述组合物包含: a) 一种或多种预聚物，所述预聚物具有平均3个以上的脂族异氰酸酯基，并且还含有烧氧基娃烧基; b) 一种或多种芳族聚异氰酸酯； c) 一种或多种具有至少一个杂环的化合物，所述杂环在暴露于水分时水解以形成至少一个异氰酸酯反应基； d) —种或多种溶剂； e) 一种或多种胺或有机金属聚氨基甲酸酯催化剂； 其中芳族异氰酸酯基与脂族异氰酸酯基的比率为0.5: 1.0至1.5: 1.0，并且异氰酸酯基与可衍生自所述一种或多种具有至少一个可水解杂环的化合物的异氰酸酯反应基的当量比为0.8: 1.0至5.3: 1.0。 1. A composition, said composition comprising: a) one or more prepolymers, the prepolymers having on average three or more aliphatic isocyanate groups and further containing baby burn burn-yl group; b) one or more aromatic polyisocyanates; c) at least one or more compounds having a heterocyclic ring, said heterocyclic ring hydrolysis upon exposure to moisture to form at least one isocyanate-reactive group; d) - one or more solvents; E) one or more amine or organometallic polyurethane catalysts; wherein the ratio of aromatic isocyanate groups to aliphatic isocyanate groups is from 0.5: 1.0 to 1.5: 1.0, and an isocyanate group and can be derived from the one or more heterocyclic ring having at least one hydrolyzable compound of an isocyanate reactive group equivalent ratio of 0.8: 1.0 to 5.3: 1.0. 2.根据权利要求1所述的组合物，其中芳族异氰酸酯基与脂族异氰酸酯基的比率为0.9: 1.0至1.5: 1.0，并且异氰酸酯基与可衍生自所述一种或多种具有至少一个可水解杂环的化合物的异氰酸酯反应基的当量比为1.5: 1.0至1.7: 1.0。 2. The composition according to claim 1, wherein the ratio of aromatic isocyanate groups to aliphatic isocyanate groups is from 0.9: 1.0 to 1.5: 1.0, and an isocyanate group and may be derived from said one or more having at least one the isocyanate compound may be a hydrolysis reaction of a heterocyclic group equivalent ratio of 1.5: 1.0 to 1.7: 1.0. 3.根据权利要求1或2所述的组合物，其中所述组合物还包含成膜性树脂。 3. A composition according to claim 12, wherein said composition further comprises a film-forming resin. 4.根据权利要求1或2所述的组合物，其中b)所述一种或多种芳族聚异氰酸酯包含聚异氰酸酯，聚合的聚异氰酸酯，或聚异氰酸酯与具有两个以上的异氰酸酯反应基的化合物的加合物中的一种或多种。 4. The composition of claim 1 or claim 2, wherein b) said one or more aromatic polyisocyanates comprises polyisocyanates polyisocyanates, polymeric, or polyisocyanate is reacted with having two or more isocyanate groups one or more compounds of the adduct. 5.根据权利要求1或2所述的组合物，其中b)所述一种或多种芳族聚异氰酸酯包含:i)聚异氰酸酯或聚合的聚异氰酸酯中的一种或多种，和ii)聚异氰酸酯与还含有烷氧基硅烷基的具有一个或多个异氰酸酯反应基的化合物的一种或多种加合物。 5. The composition of claim 1 or claim 2, wherein b) said one or more aromatic polyisocyanates comprises: i) a polyisocyanate or a polymeric polyisocyanate or more, and ii) polyisocyanates containing alkoxysilane with a further group of compounds having one or more isocyanate reactive groups of one or more adducts. 6.根据权利要求4所述的组合物，其中聚异氰酸酯与具有一个或多个异氰酸酯反应基的化合物的一种或多种加合物包含含磷聚异氰酸酯和含有一个或多个异氰酸酯反应基的氨烷基硅烷的反应产物。 6. The composition as claimed in claim, wherein the polyisocyanate with a compound having one or more isocyanate reactive groups of one or more adducts containing phosphorous polyisocyanates and containing one or more isocyanate reactive groups the reaction products of alkyl silane ammonia. 7.根据权利要求1或2所述的组合物，其中所述一种或多种具有至少一个在暴露于水分时水解的杂环的化合物包含含有一个或多个吡咯基的一种或多种化合物。 7. The composition of claim 1 or claim 2, wherein said one or more compounds having at least one hydrolyzed when exposed to moisture comprises one heterocyclic ring containing one or more pyrrolyl or more compound. 8.根据权利要求1或2所述的组合物，其中所述一种或多种具有至少一个在暴露于水分时水解的杂环的化合物包含含有一个或多个曝唑烷基的一种或多种化合物。 8. The composition of claim 1 or claim 2, wherein said one or more compounds having at least one hydrolyzed when exposed to moisture-containing heterocyclic ring containing one or more oxazolidine groups or one kind of exposure more compounds. 9.根据权利要求1或2所述的组合物，其中所述一种或多种具有至少一个在暴露于水分时水解的杂环的化合物包含含有一个或多个双曝唑烷基的一种或多种化合物。 9. A composition according to claim 1 or claim 2, wherein said one or more of at least one compound having a hydrolysis when exposed to moisture-containing heterocyclic ring containing one or more bis oxazolidine groups exposed or more compounds. 10.根据权利要求1或2所述的组合物，其中基于组合物的重量，所述组合物中的烷氧基硅烷基的重量百分数为1.0至10重量％。 10. The composition of claim 1 or claim 2, wherein based on the weight of the composition, the composition by weight of alkoxysilane groups was 1.0 percent to 10 weight percent. 11.根据权利要求1或2所述的组合物，其中所述组合物还包含一种或多种增强填料。 11. A composition according to claim 1 or claim 2, wherein said composition further comprises one or more reinforcing fillers. 12.根据权利要求1或2所述的组合物，所述组合物包含: a) I重量％至90重量％的一种或多种预聚物，所述预聚物具有平均3个以上的脂族异氰酸酯基，并且还含有烷氧基硅烷基； b) I重量％至30重量％的一种或多种芳族聚异氰酸酯； c) I重量％至10重量％的一种或多种具有至少一个杂环的化合物， 所述杂环在暴露于水分时水解以形成至少一个异氰酸酯反应基；d)35重量％至85重量％的一种或多种溶剂； e)0.0l重量％至5重量％的一种或多种胺或有机金属聚氨基甲酸酯催化剂； f)0重量％至8重量％的一种或多种成膜性树脂； g)0重量％至20重量％的一种或多种颜料； 其中，百分数基于所述组合物的总重量。 12. The composition of claim 1 or claim 2, said composition comprising: a) I% to 90% by weight of one or more prepolymers, said prepolymers having an average of three or more aliphatic isocyanate groups and further containing alkoxysilane groups; B) to 30% by weight I% by weight of one or more aromatic polyisocyanates; C) I wt% to 10 wt% of one or more of at least one heterocyclic compound, the heterocyclic hydrolysis upon exposure to moisture to form at least one isocyanate-reactive group; d) 35 wt% to 85 wt% of one or more solvents; e) 0.0l to 5 wt% wt% of one or more amine or organometallic polyurethane catalysts; f) 0 wt% to 8 wt% of one or more film forming resins; g) 0 wt% to 20 wt% of a one or more pigments; wherein percentages based on the total weight of the composition. 13.根据权利要求12所述的组合物，其中组分b)包含:3重量％至15重量％的i)聚异氰酸酯或聚合的聚异氰酸酯中的一种或多种，和I重量％至7重量％的ii)聚异氰酸酯与还含有烷氧基硅烷基的具有两个以上的异氰酸酯反应基的化合物的一种或多种加合物。 13. The composition according to claim 12, wherein component b) comprises: polyisocyanate 3 wt% to 15 wt% of i) polyisocyanates or polymeric one or more, and I wt% to 7 % by weight of ii) a polyisocyanate and alkoxysilane groups also contain two or more compounds of the isocyanate reactive groups having one or more adducts. 14.一种用于将两个基底粘合在一起的体系，所述体系包含:根据权利要求1至13中任一项所述的组合物，以及具有选自丙烯酸，甲基丙烯酸，异氰酸酯，甲硅烷氧基或它们的组合物中的一种或多种官能团的粘合剂。 14. A method for bonding two substrates together system, the system comprising: 1 to 13 one of the compositions, and, methacrylic acid, acrylic acid selected from isocyanate claim, one or more functional groups adhesive siloxy or composition thereof. 15.一种对表面涂底漆以增强聚异氰酸酯官能粘合剂与所述表面的粘合的方法，所述方法包括将根据权利要求1至13中任一项所述的组合物与所述表面接触并使溶剂蒸发。 15. A primed surface to enhance a polyisocyanate functional adhesive to the surface of the bonding method, the method comprises a composition according to any one of claims 13 to claim the The solvent was evaporated and the contact surface. 16.—种将两个基底粘合在一起的方法,所述方法包括: a)将根据权利要求1至13中任一项所述的组合物涂敷到所述基底中的一个或多个的表面上，并且使溶剂蒸发掉； b)将异氰酸酯官能粘合剂涂敷到根据步骤a)对其涂敷所述组合物的两个以上基底的所述表面上； c)将所述两个以上基底在所述粘合剂布置在所述基底之间的情况下接触在一起；和d)允许所述粘合剂固化，从而将所述两个以上基底粘合在一起。 16.- method two substrates bonded together, said method comprising: a) the substrate according to one or more of the composition of claim 1 to 13 is applied to one of the on the surface, and the solvent was evaporated off; b) the isocyanate functional adhesive is applied according to step a) two or more thereof on the surface of the coating composition of the substrate; c) the two or more substrates in a case where the adhesive is disposed between said substrate contacts together; and d) allowing the adhesive is cured, whereby the two or more substrates together. 17.根据权利要求15或16所述的方法，其中所述底漆的涂敷至所述粘合剂的涂敷之间的时间为20秒至I年。 17. The method of claim 15 or claim 16, wherein the time between applying the primer coating to the binder is from 20 seconds to I years. 18.根据权利要求16所述的方法，其中在步骤a)之后，将所述基底中的一个或多个移动到用于进行步骤b)的另一个位置。 Another position 18. The method according to claim 16, wherein in step a), one or more mobile in said substrate to be used in step b). 19.一种制品，所述制品包括基底，所述基底上沉积有根据权利要求1至13所述的组合物。 19. An article of manufacture comprising a substrate, depositing on said substrate with the composition of claim 1 to claim 13. 20.一种制品，所述制品包括基底，所述基底上沉积有:没有溶剂的根据权利要求1至13所述的组合物。 20. An article of manufacture comprising a substrate, said substrate having deposited: no composition according to claim 113 according to claim solvent. FR2699529B1 (en) * 1992-12-18 1995-02-03 Saint Gobain Vitrage Int A method of treating a pane for the adhesion of a peripheral profile. ES2308298T3 (en) 2008-12-01 System for bonding glass to a structure.